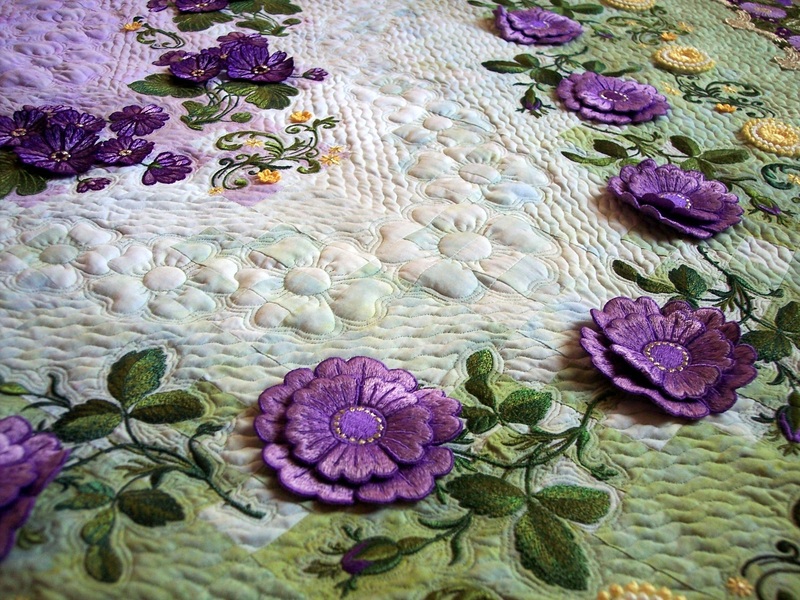 Machine embroidery finds its way into much of my work, both garments and quilt, and sometimes in new and unusual ways. 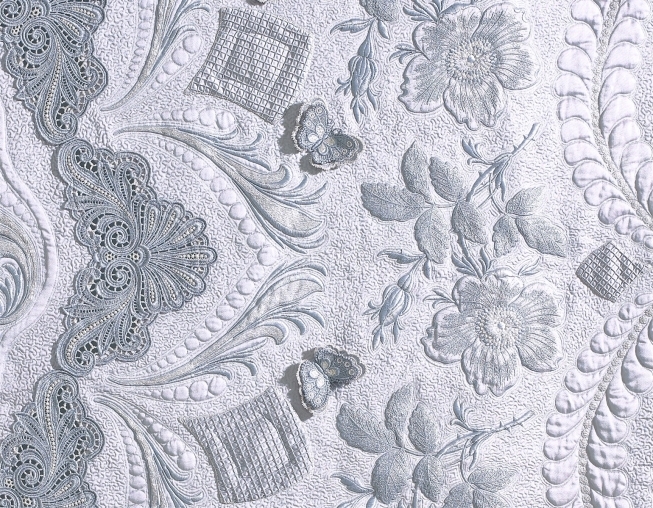 I particularly like using machine-embroidered free-standing lace on my quilts. 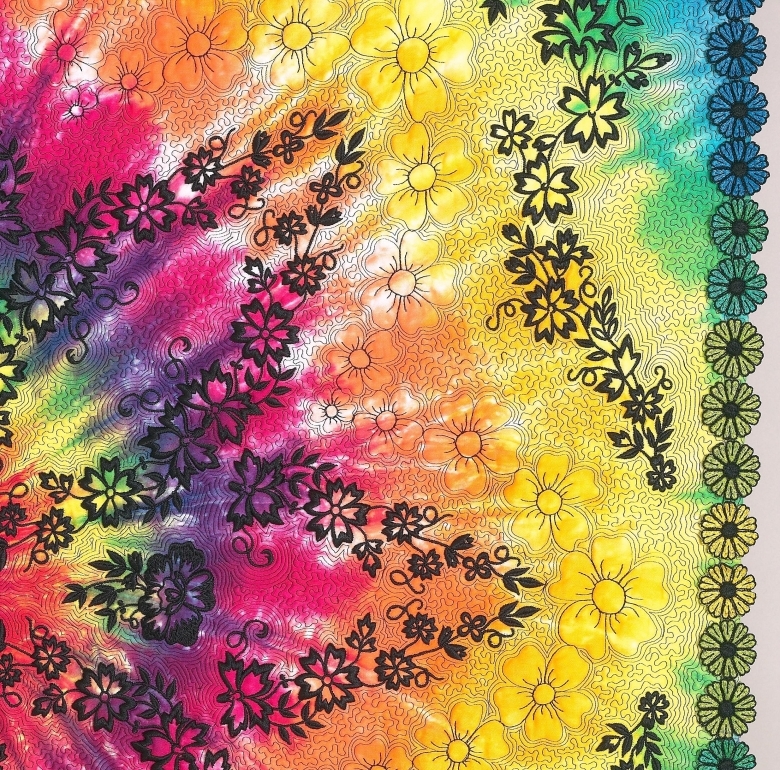 These are designs that have been specifically digitized to be stitched on a water-soluble substrate, then, when the substrate is dissolved, the threadwork remains. Not every design can be used like this. Well, any design can be stitched on water-soluble stabilizer, but when the stabilizer is dissolved, all that will remain is a wad of thread! 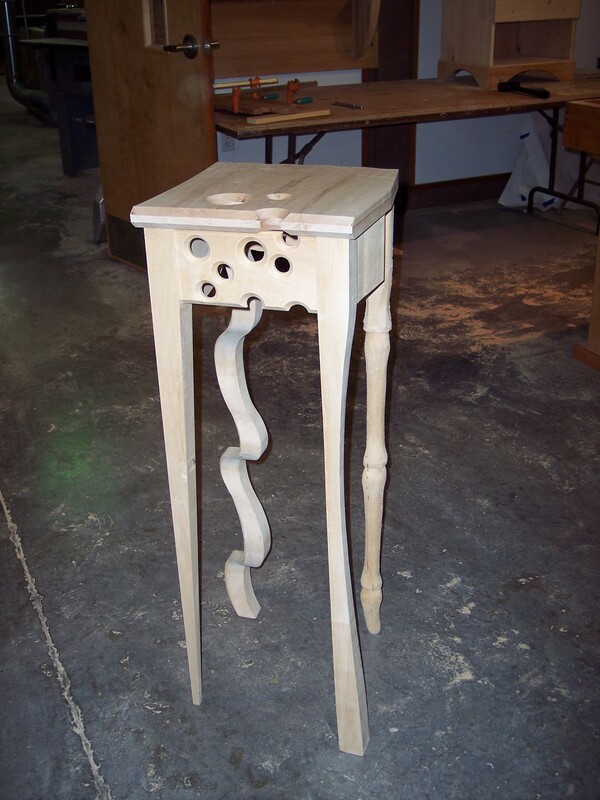 FSL designs have a great deal of supportive stitching, and retain their shape when the stabilizer is removed. I’m quite partial to Zundt FSL designs, and all of the samples below are from Zundt. 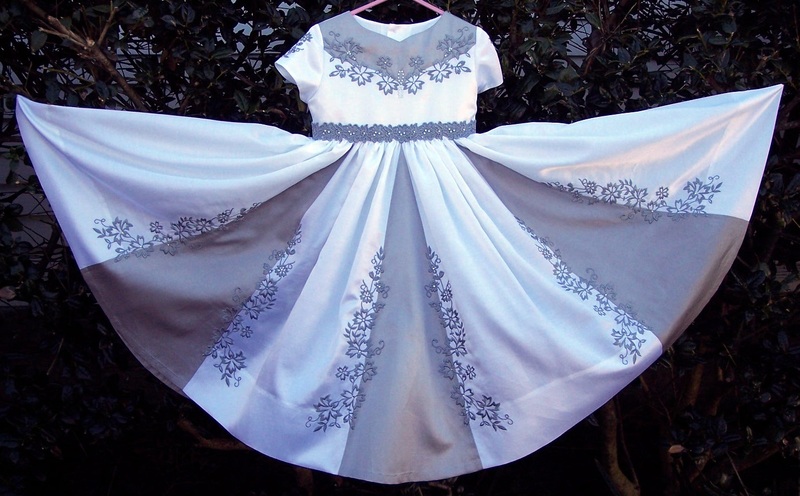 With free-standing lace, the back of the design will be visible as well as the front. 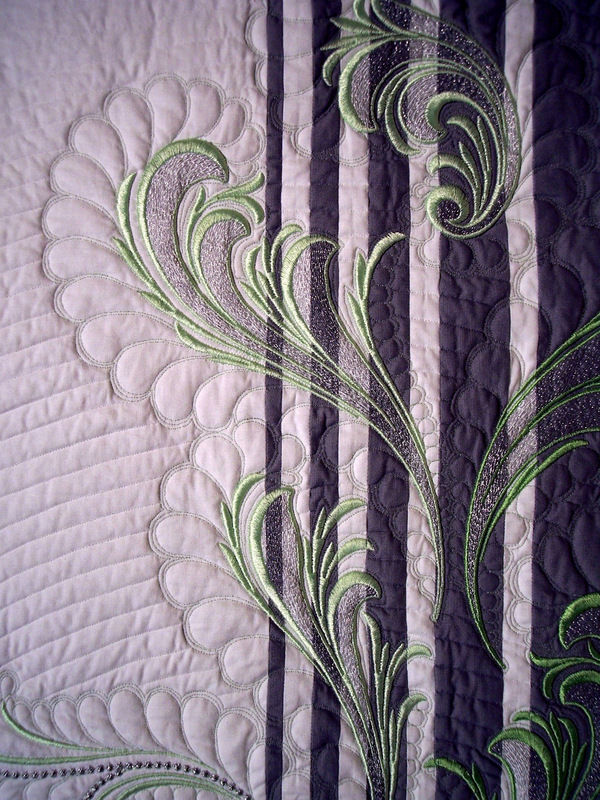 When I attach the lace as an edging or insert on my quilts, the back of the lace can be seen on the back of the quilt. And the back is half the quilt! I want the back to be pretty. 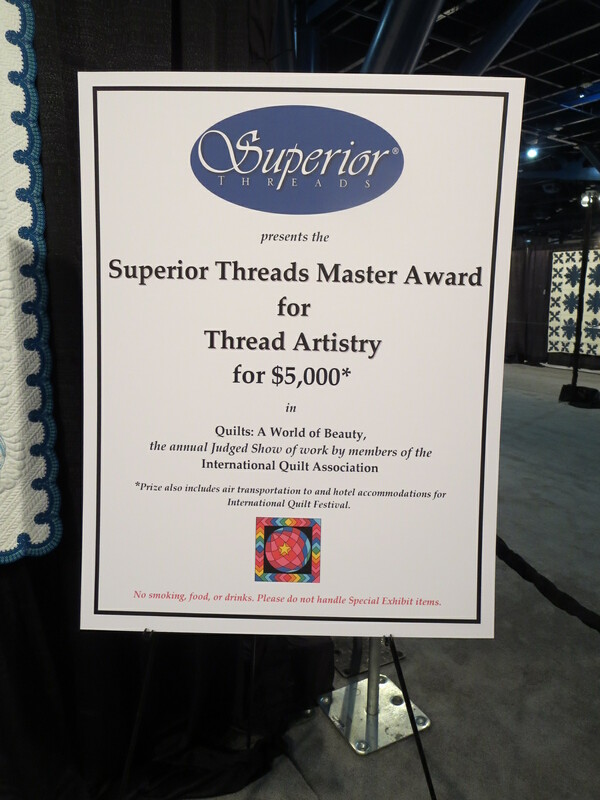 I almost always use Superior Threads Bottom Line thread in the bobbin for machine embroidery. It’s the perfect weight, it creates no lint, and it comes in lots of colors, so I can match the bobbin thread pretty closely to the top thread. 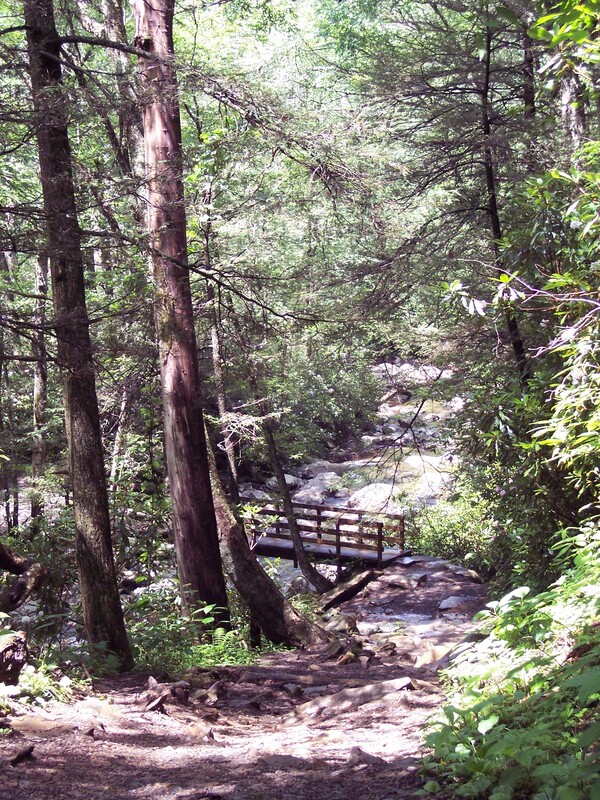 …and back. 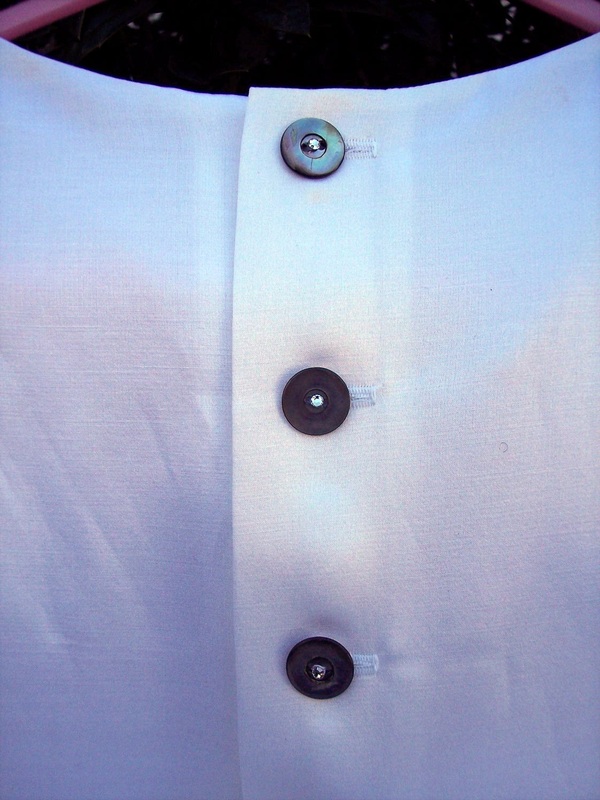 I changed bobbin thread, using light gray for the silver metallic sections, and purple for the rest. Okay, now let’s say I’m using a lace design with lots of colors, and I can’t use the same bobbin thread for the whole design without having the back look ugly. 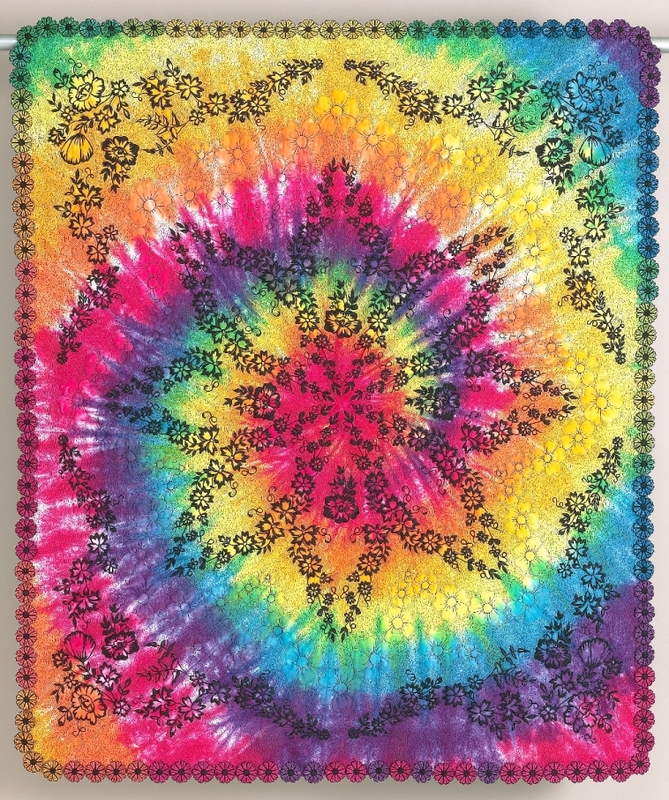 And let’s say that I’m making edging for a big quilt, and need to stitch this design 80 or 90 times! That’s a lot of bobbin changes. But we do what we need to do! 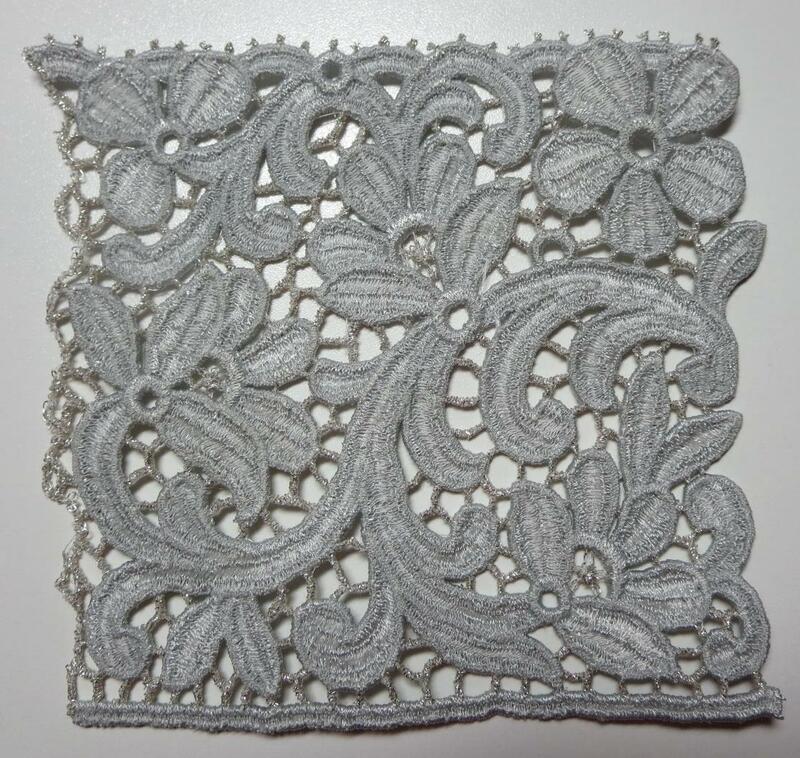 And that’s what I did for the lace on Gloria’s Garden. You can see on the back that I changed a lot of bobbins! I’m working on a new quilt. 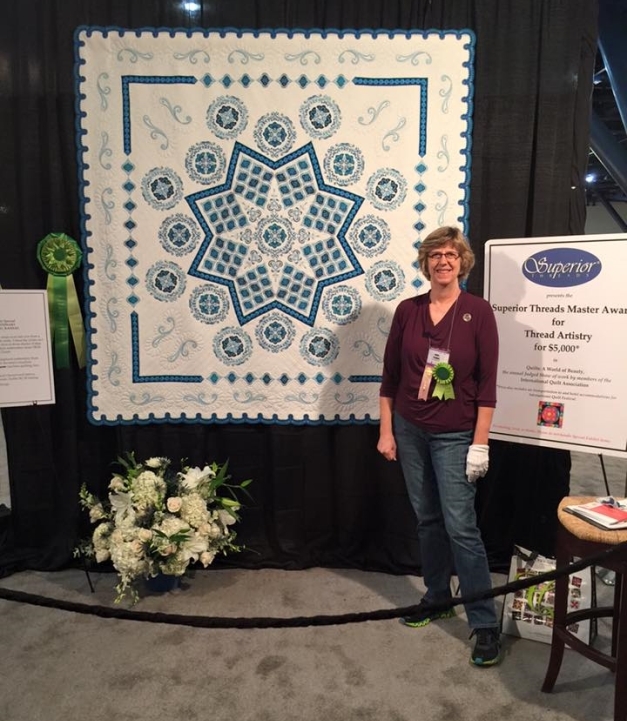 A big quilt. And I want to edge it in lace. 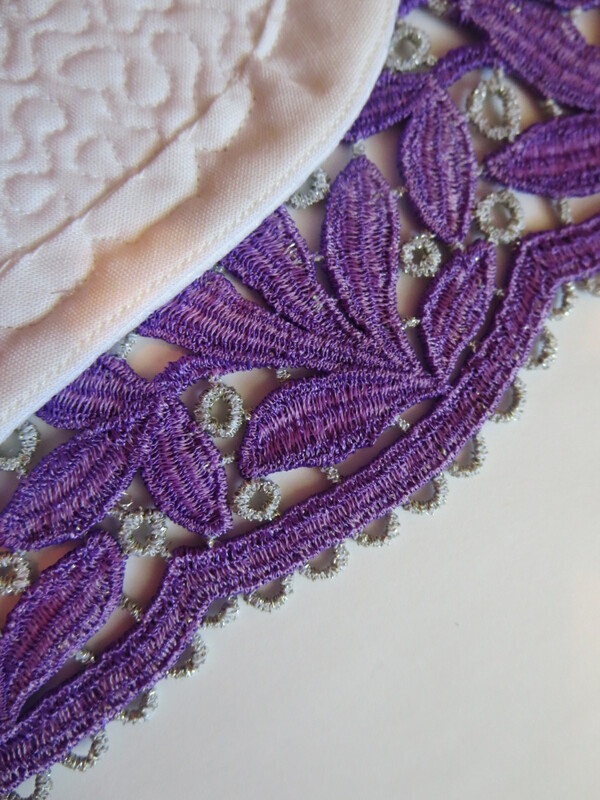 And the lace has a lot of color changes. Here’s the front of a section. Here’s the back of that section, which I stitched with green bobbin thread. Wow! Look at that back! 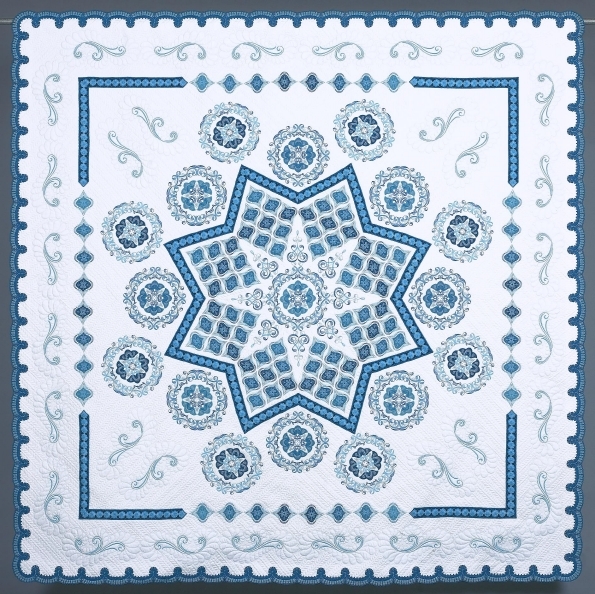 It’ll be great for my quilt! The monofilament bobbin thread even makes the front look better, I think. I used Superior MonoPoly Reduced Sheen Clear. It stitched beautifully on my 15-needle commercial machine. I haven’t tried it on a home combo machine, but I have no reason to think that it wouldn’t work well. 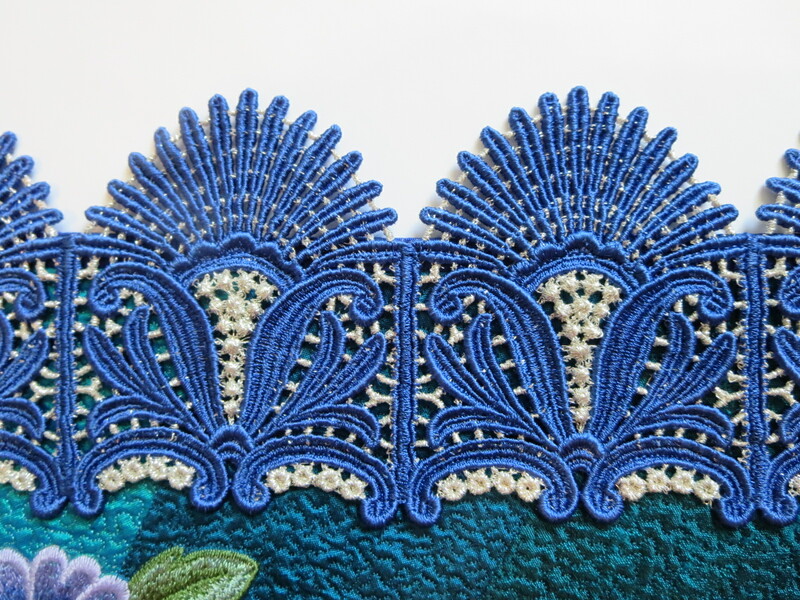 I like to dissolve away all the stabilizer in my lace so it has a nice soft hand. The final product with MonoPpoly is just a bit stiffer than if it were stitched with Bottom Line, but not much. An added benefit is that you can wind a LOT of monofilament on a bobbin! I think I’ll do it this way a lot! 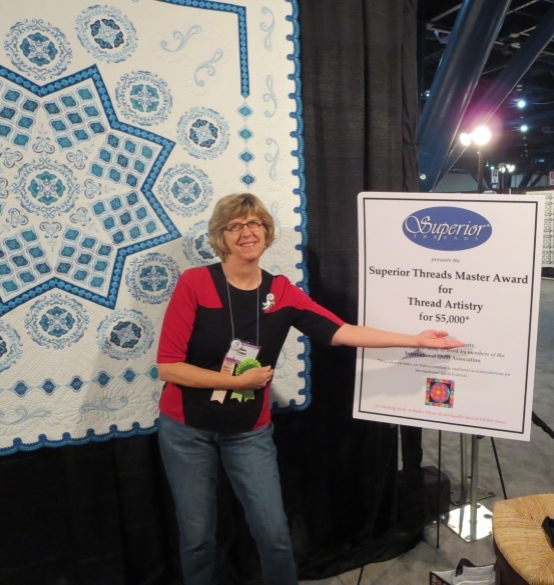 Now I know that I’m probably the only person in the world who makes FSL to edge large quilts! But many of you make bookmarks and Christmas ornaments and small FSL items. This technique would be great for that! Try it and let me know if you like it! 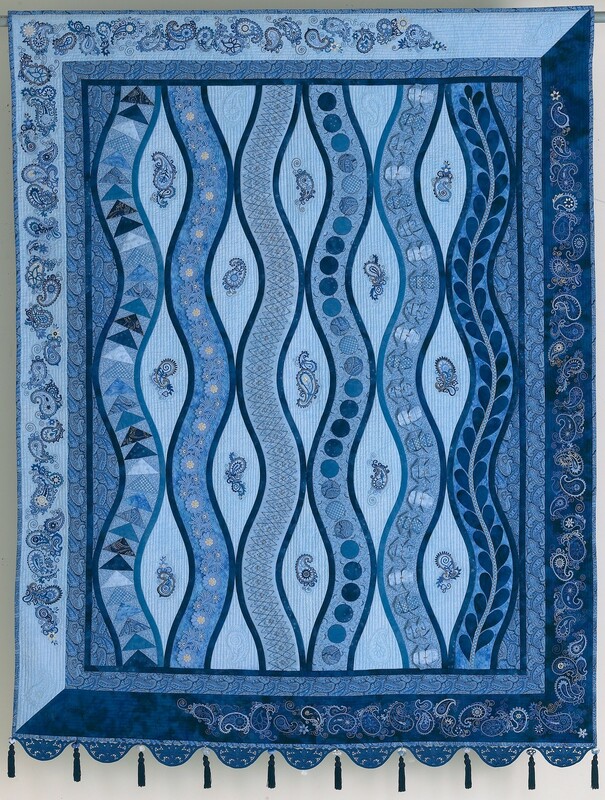 Once in a while, I make a quilt that is not exactly my style! 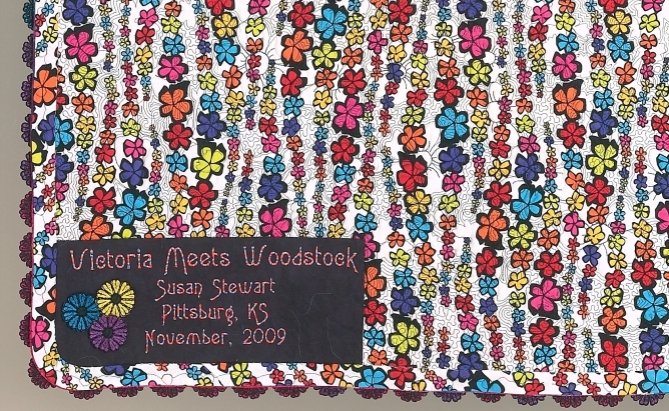 “Victoria Meets Woodstock” (35.5″ x 42″, made in 2009) started with a gorgeous hand-dyed cotton sateen fabric panel from Bryerpatch Studio. It was originally intended for this little quilt I made for Mark’s office door (Mark’s Little Quilts) but I decided the fabric was too pretty to use as a background, and that I needed to do something special with it instead. So, I embroidered designs from one of the Martha Pullen Kent State book/embroidery CD sets. 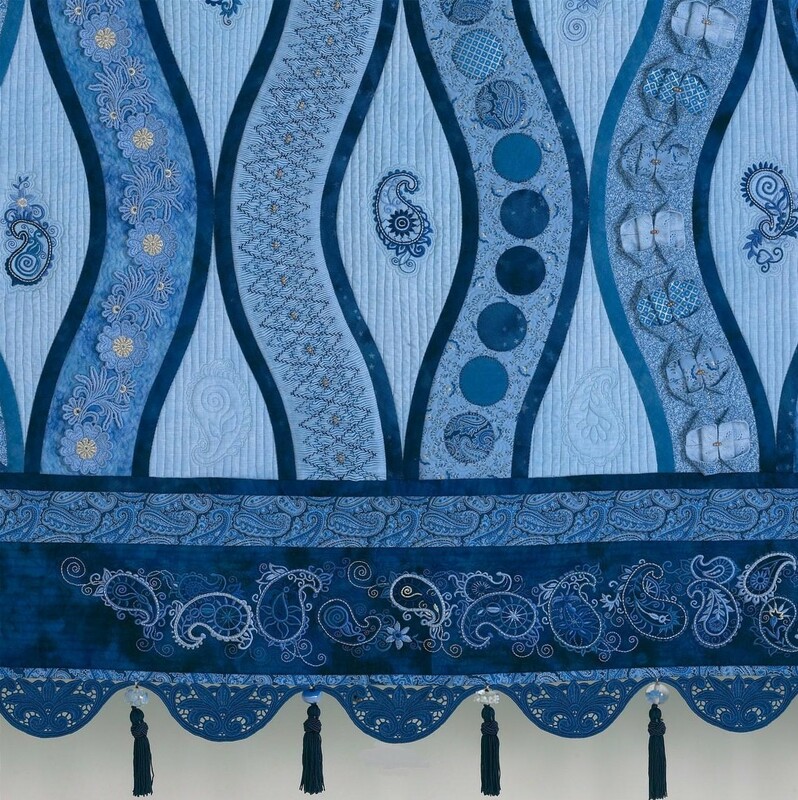 Not the white or light-colored embroidery as shown on the antique garments, but black embroidery on bright swirling colors! 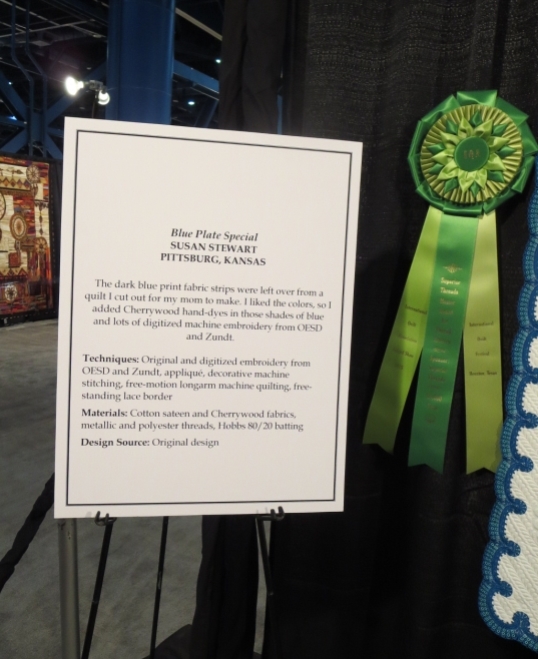 Lots of black free-motion quilting, stitched with fine silk thread, creates the appearance of black Victorian lace. 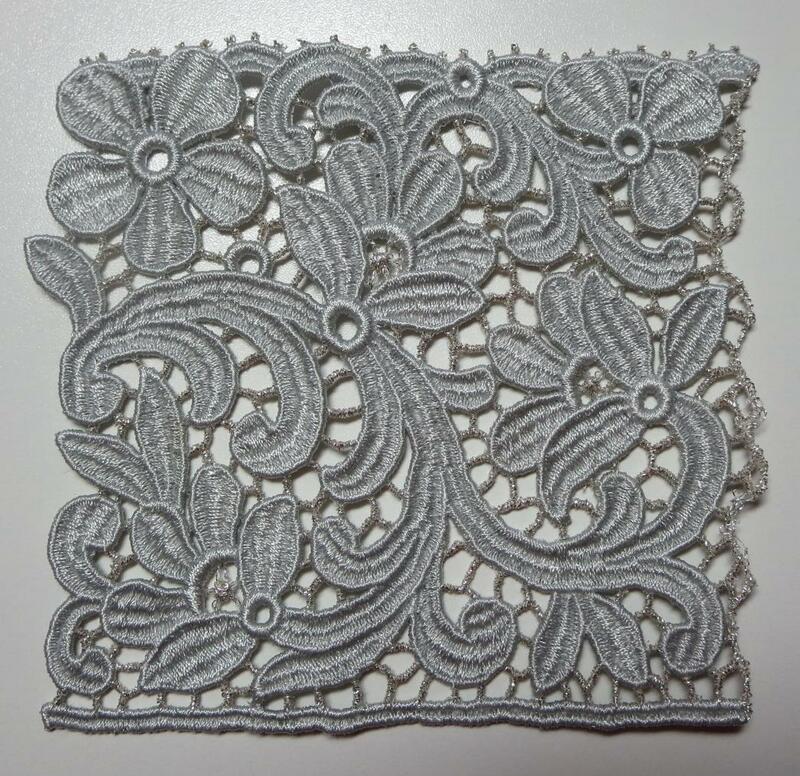 I had made a black scalloped, machine-embroidered Zundt free-standing lace border, but the quilt ended up too small for the border. So I used that black lace on a jacket I made for myself! This is not the best picture of me, but it shows the jacket well! I have worn this jacket so much! It’s a texture-y poly knit, it’s comfortable, it goes with everything, it washes well, and it looks good – what else is there? I made it from the t-shirt pattern in The Sewing Workshop’s Trio pattern. 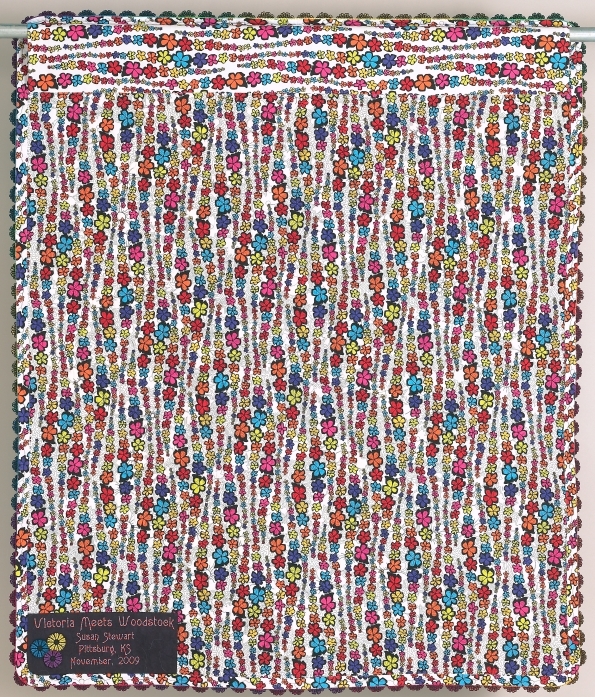 Of course, this doesn’t look at all like that pattern! I changed the pattern to have a front opening, V-neck, and long sleeves 🙂 I made facings for the neckline and front opening, then stitched that unused black lace on top. 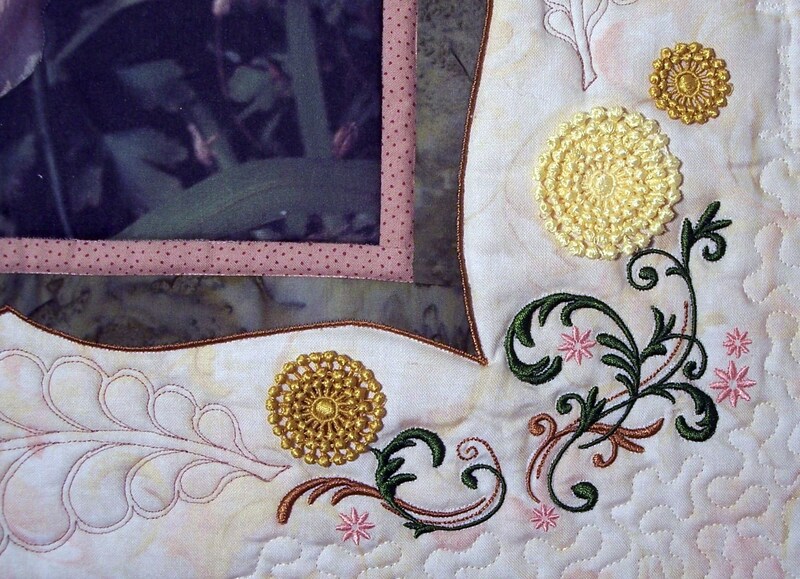 Okay, back to the quilt…Instead of the black lace, I machine-embroidered individual little free-standing lace flowers (again, Zundt, from the Adorations 3 collection) in the colors of the fabric, and stitched them on the outer edge. 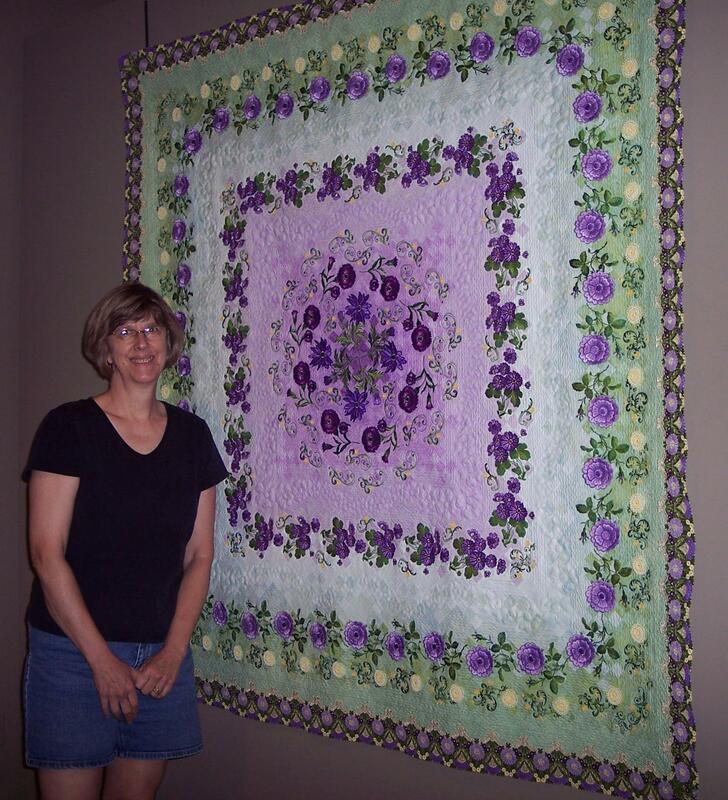 If you look at the full photo of Victoria Meets Woodstock at the top of this post, you can see that I matched the colors of the flowers to the colors of the outer edge of the quilt, so that the color flow continued into the flower edge! I had used those same FSL flowers in Gloria’s Garden. 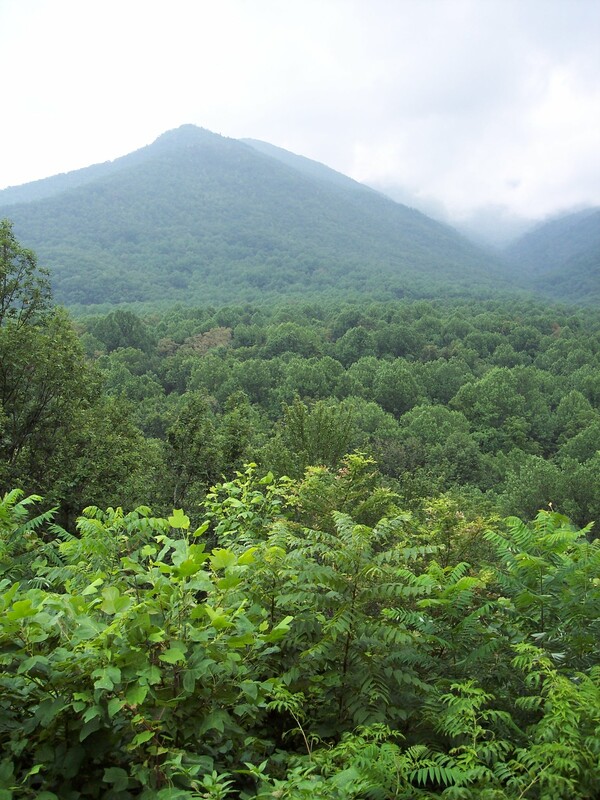 The design is one of the dark purple flowers in the upper left hand corner of this photo. Again, back to Victoria Meets Woodstock! 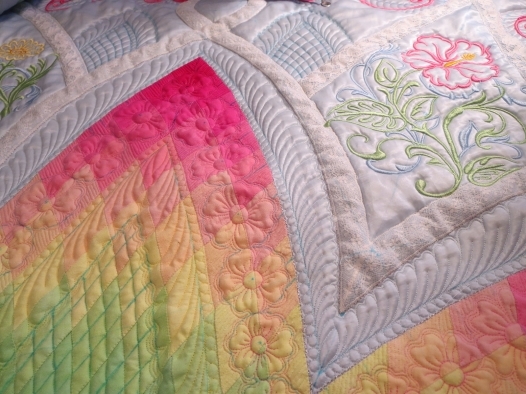 I like my quilt backs to relate to the front – after all, the back is half the quilt! I found this wonderful flowery stripe that was perfect! I usually bind my edges in some way, but in this case, I used the backing fabric to make a bias facing. And check out the label! 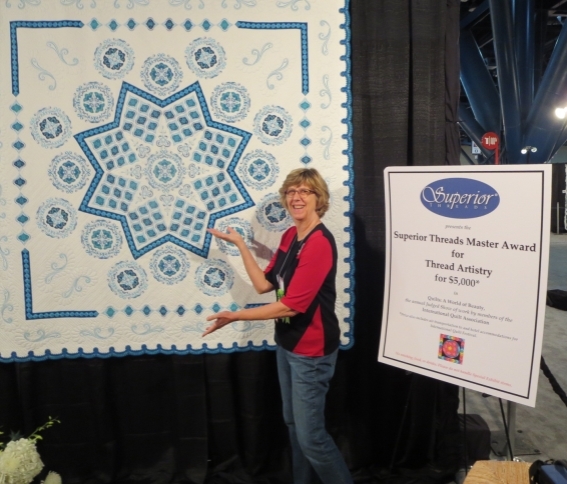 This quilt won 2nd place in the Wall Quilts – Machine Quilted category at the 2011 AQS Knoxville show. That was the only show into which it was entered – I forgot about it until it was too old to enter into any other shows! 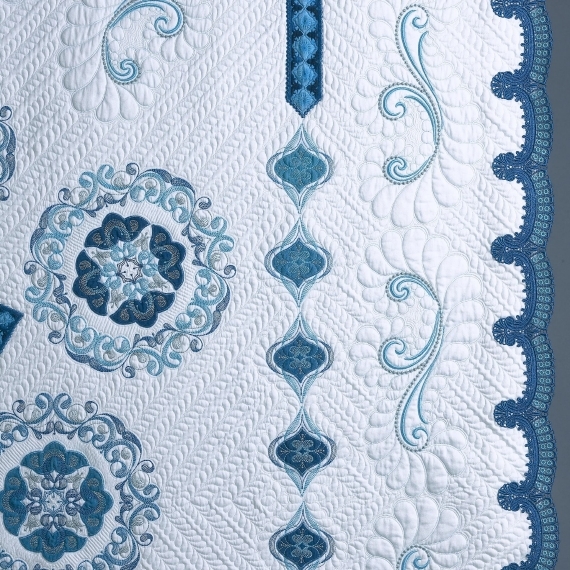 It’s hard to imagine forgetting about a quilt this bright! You may have noticed that I use a lot of machine embroidery designs that are not “things.” No animals, no people, no coffee cups, no still lifes. Sometimes floral designs. But mostly, I really like swirl designs that lend themselves to many different looks. I’ve written about two other designs in this post and this post. 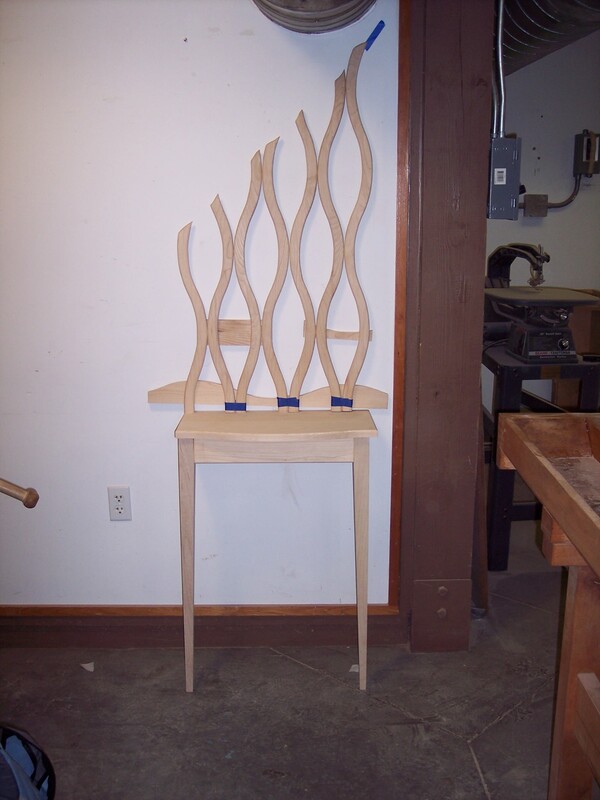 Today I’m featuring a set of designs (yes, Zundt!) that I’ve used in several ways. 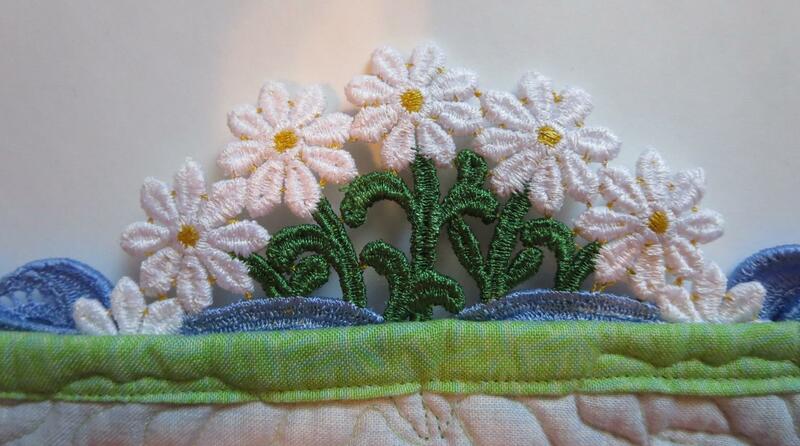 The designs have a satin stitch outline around a long, open, running-stitch filled center. 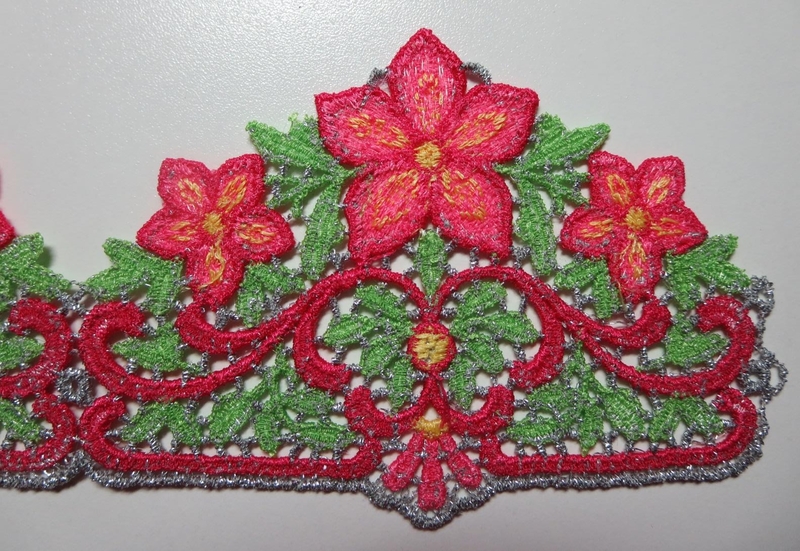 Here I used just the smallest design, repeated and mirrored to form a border. When those center fill stitches are stitched with metallic thread, it creates a soft, shimmery look that almost looks like it’s been painted. The swirl design here is just to the left of the butterflies. 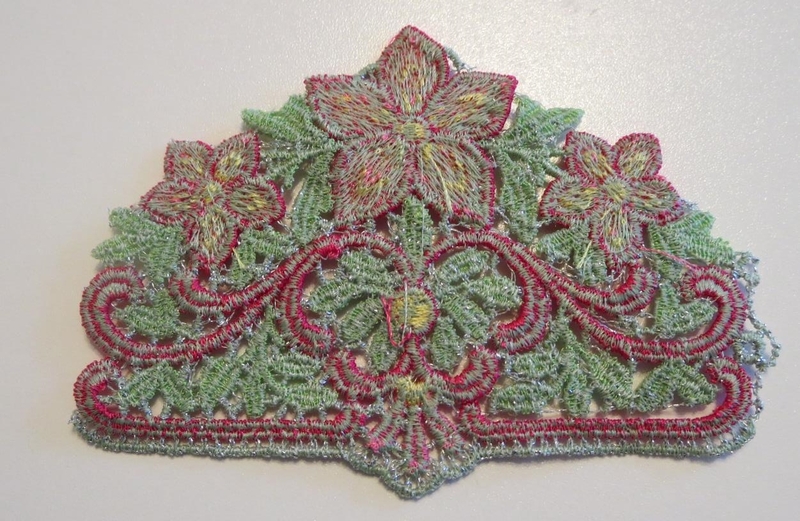 I also used a couple of large floral designs and free-standing lace. 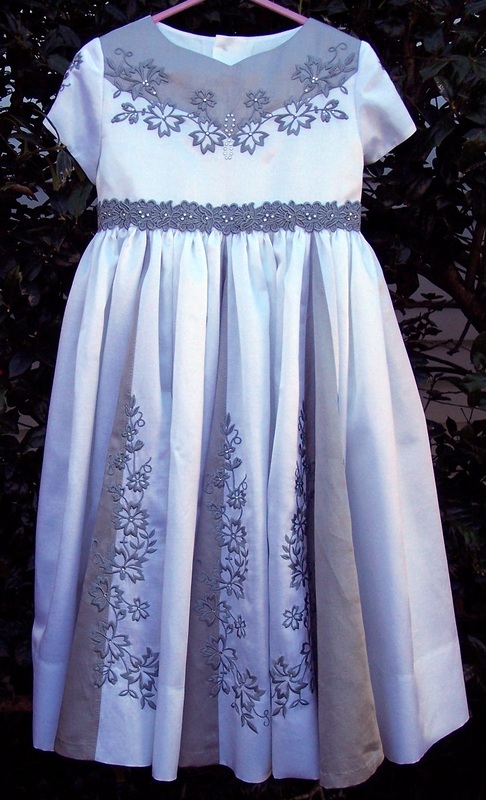 The fabric is silver gray Radiance, and all of the embroidery (all Zundt) was done with gray Isacord and silver metallic thread. 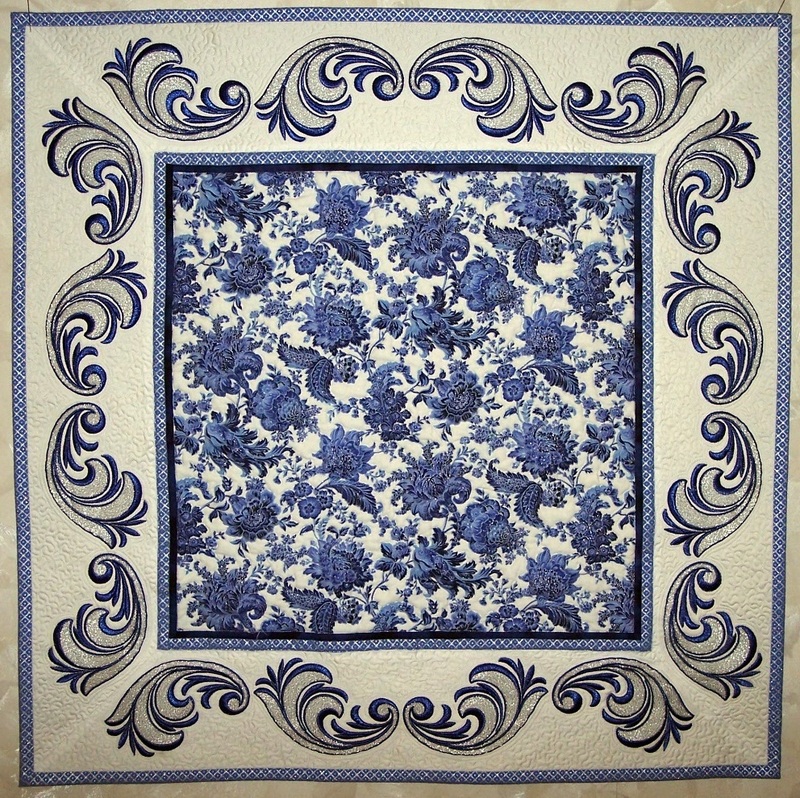 The butterflies, the large lace motifs (the quilt was cut from behind the motifs) and the wide lace edging (not visible in this photo; look at the full shot above) are free-standing lace. 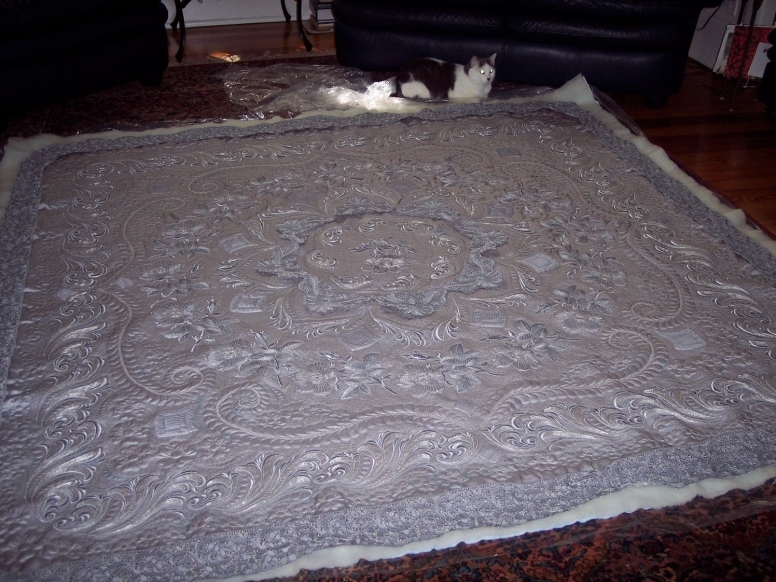 It is 85 inches square, and the embroidery used approximately 47,000 yards of thread and nearly 5,000,000 embroidery stitches. 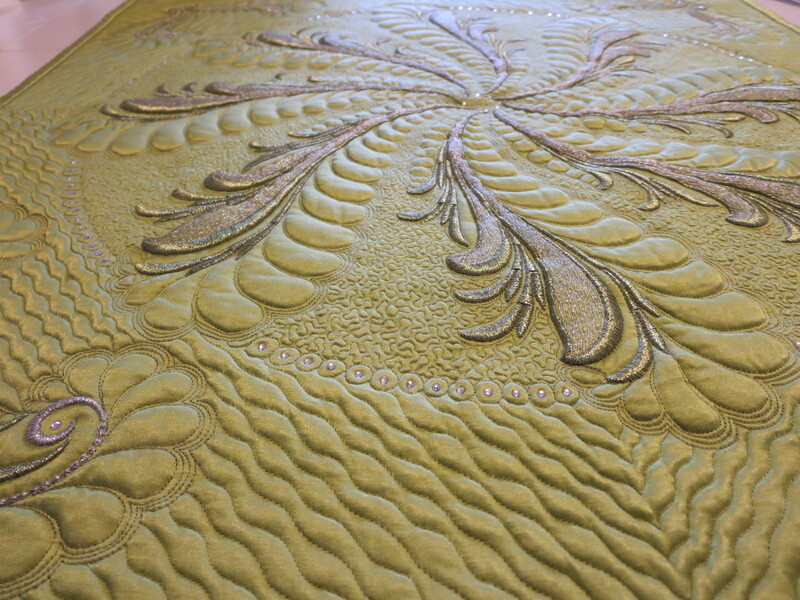 After the embroidery on the fabric was done, I free-motion quilted with Superior Threads silk Kimono thread. 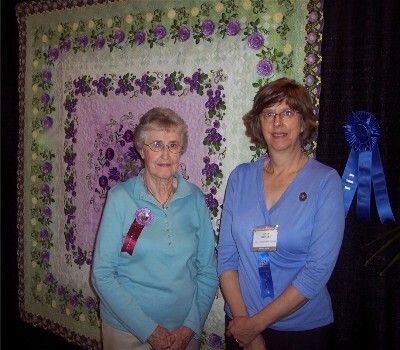 and a first place at Paducah in 2011. 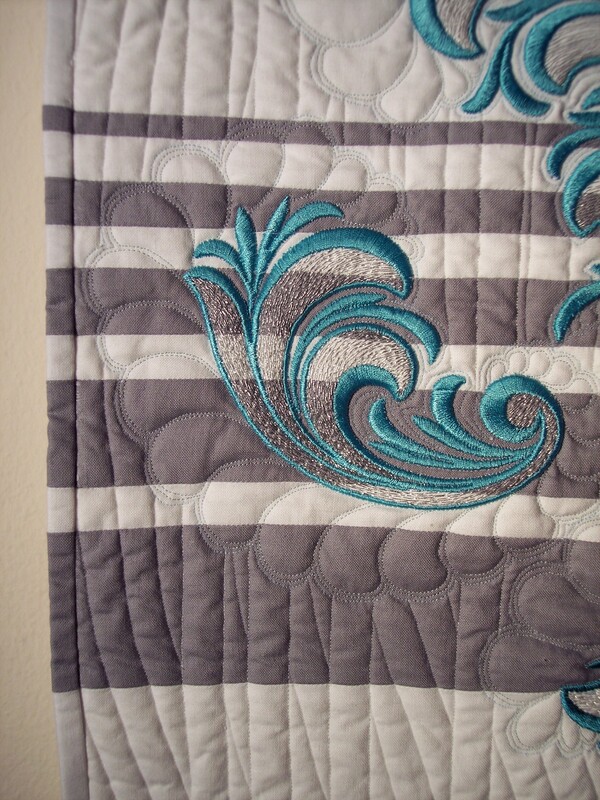 I pieced white and dark gray Kona cotton, then embroidered swirls over the pieced fabric. 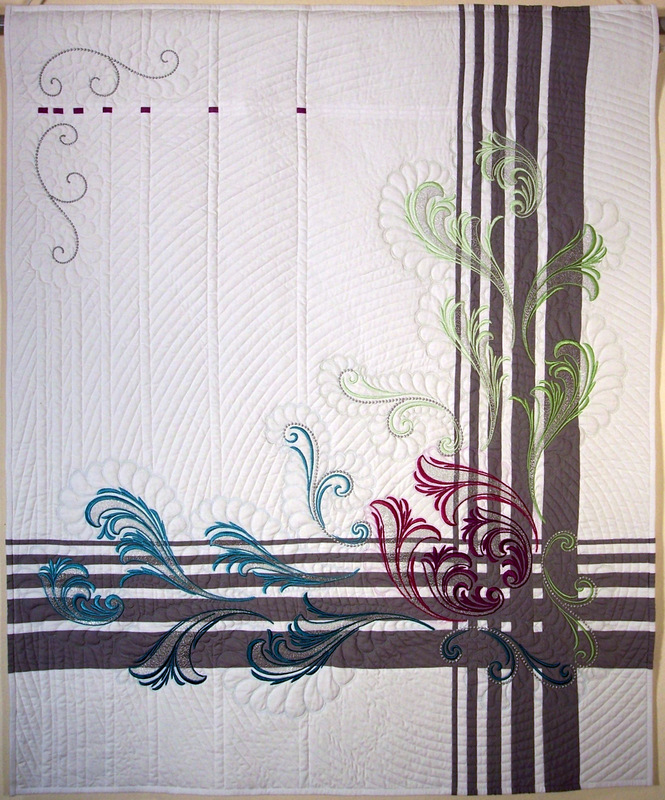 I love the way the piecing shows through the metallic-filled swirl centers – a lovely transparency! 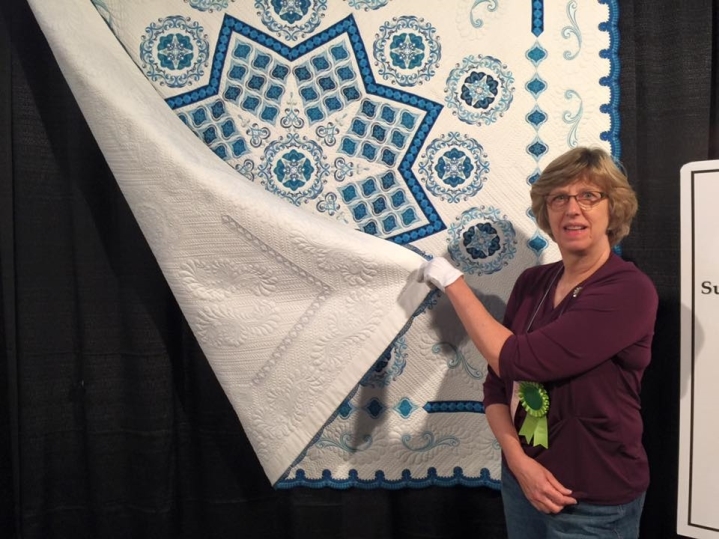 Actually, I wasn’t pleased with the way the edge of the quilt was slightly stretched, so I later took off the binding and re-did it so it would be smoother, but I couldn’t find a picture of the final edge. 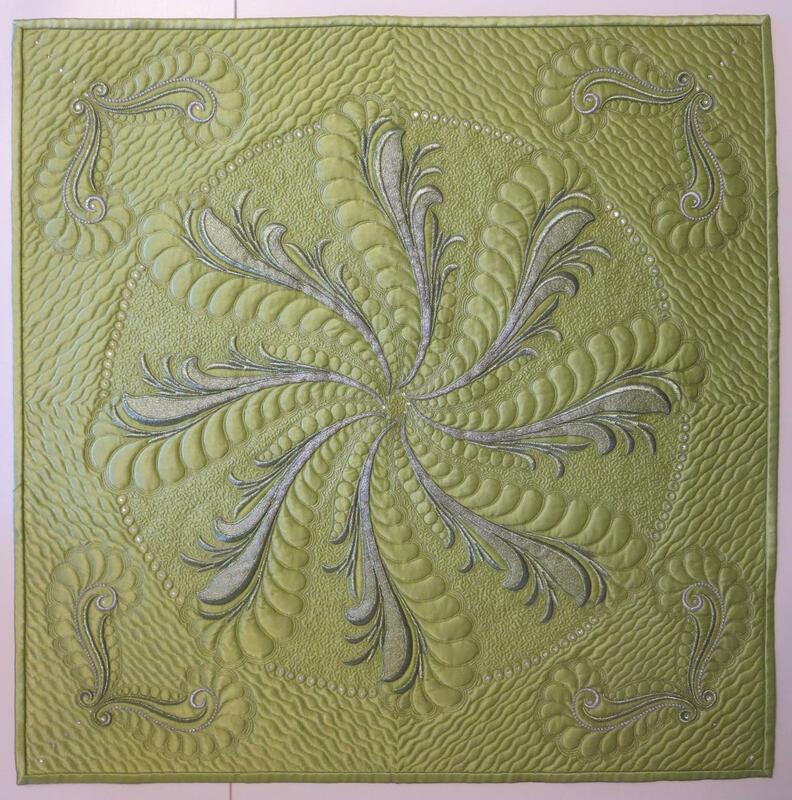 Finally, here is a little quilt I made, “Lime Frost”, which will probably be a donation quilt at some point. 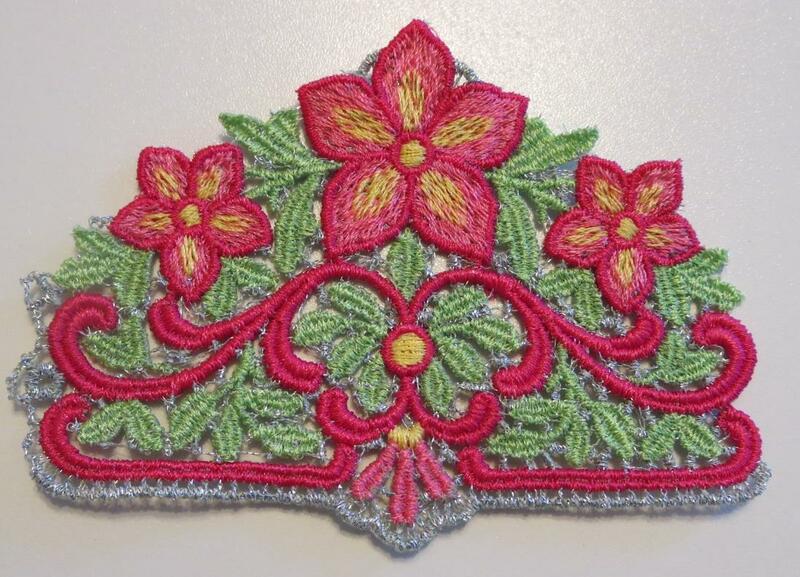 It is Radiance, apple green and silver metallic thread, and a few Swarovski crystals. 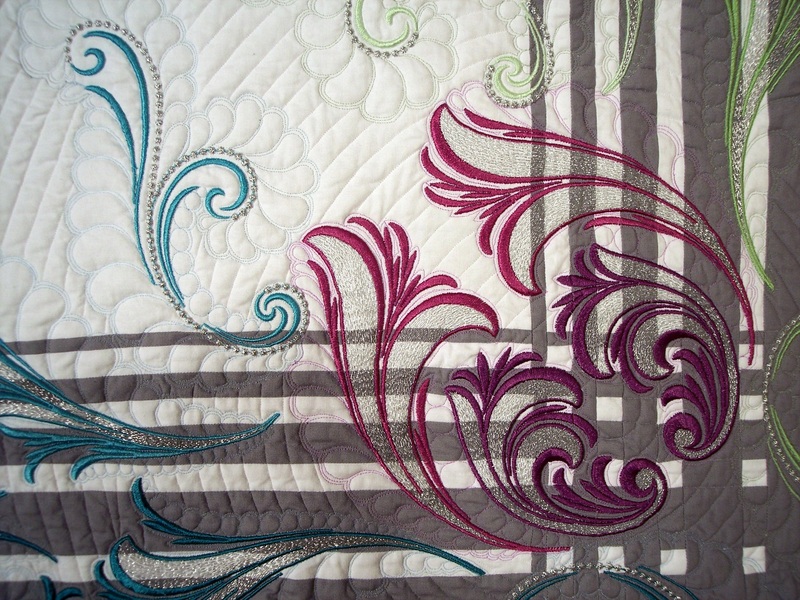 Besides the large central swirls that were also used in the other quilts, the smaller corner swirls are from my Craftsy class project. 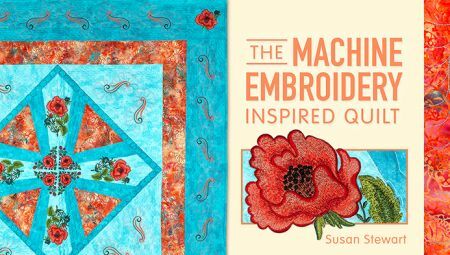 I hope this has inspired you to think of using those embroidery designs in multiple ways, and to use them as the base for lovely quilting! During the past week, I participated in the 5-day artist challenge that has been making its way around Facebook. 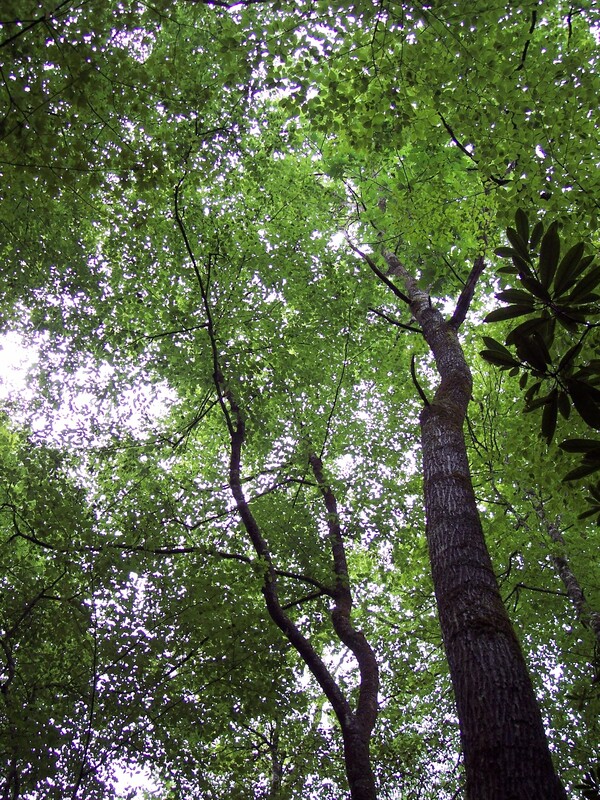 It involved posting three projects for five days, and nominating one person each day to continue the challenge. 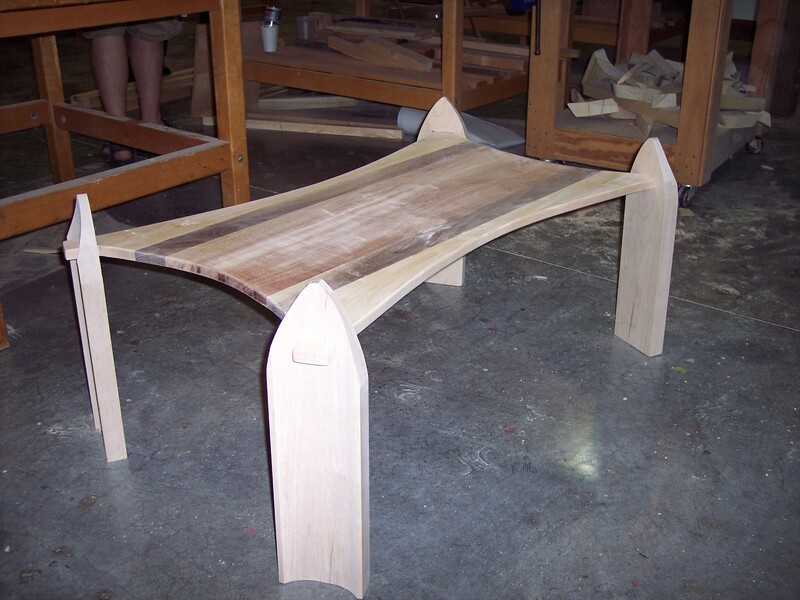 Well, thinking of projects for that challenge, plus the ideas I have for this blog, have brought home to me the large and varied body of work I have created. 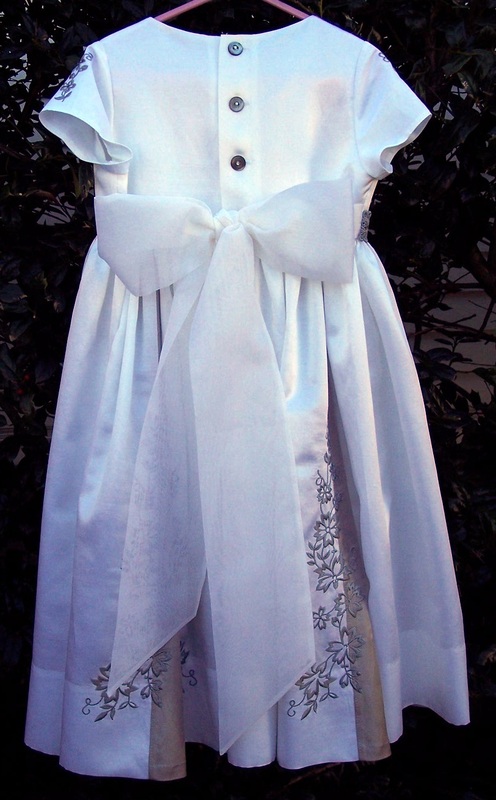 It’s kind of fun to look back at all – well, at least some – of the things I have made with fabric and thread! 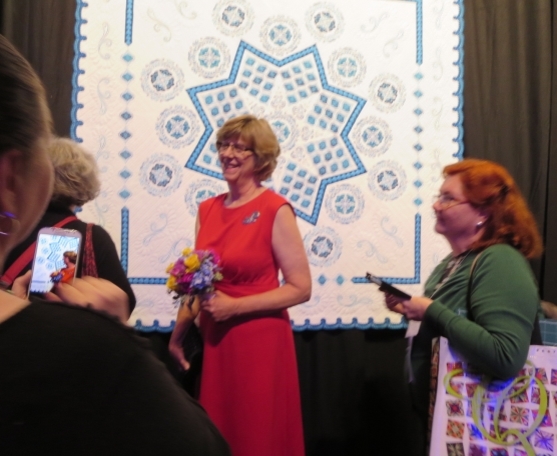 In the challenge, I posted photos of Shark’s Teeth garments, elaborate Christening gowns, some of my favorite quilts, and a prom dress! So here’s yet another type of work I’ve done. 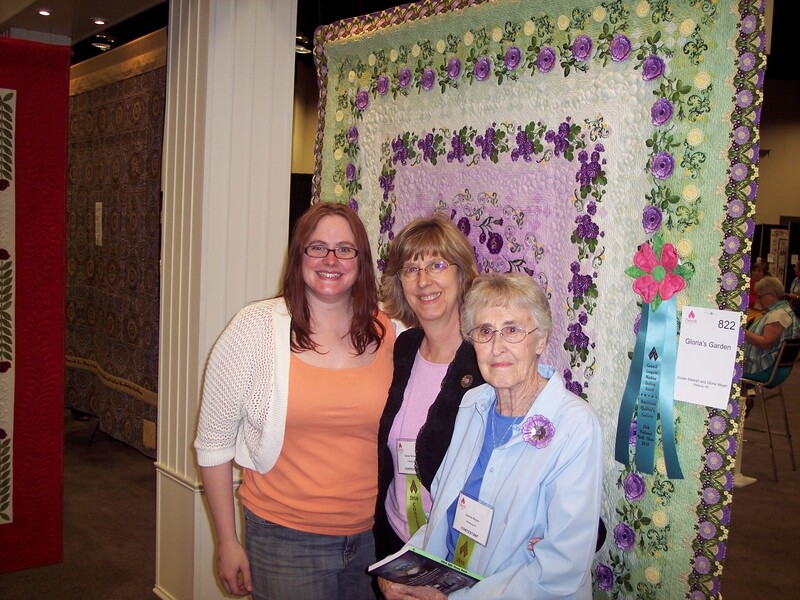 This is a group of small wall quilts I made in 2010. I like to take close-up photos of the flowers in my back yard. 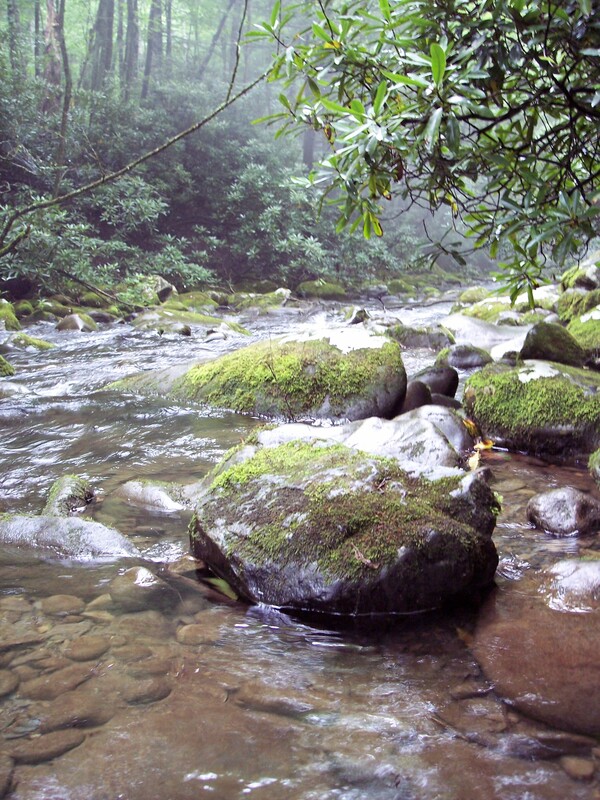 I don’t have a fancy camera, or any particular knowledge of photography. 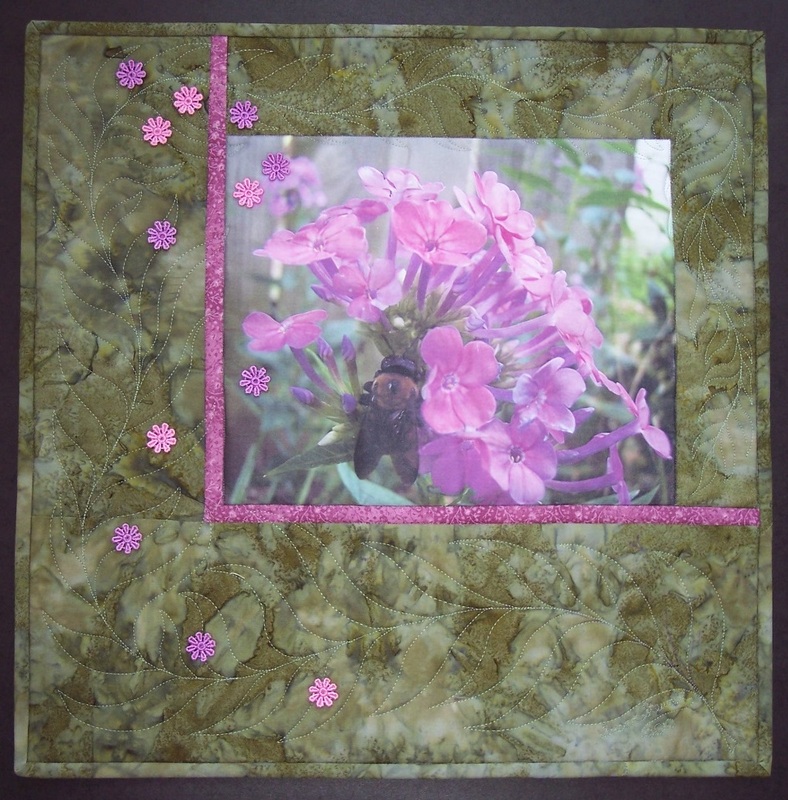 Some of these photos were printed on photo transfer fabric, and I incorporated them into little quilts. 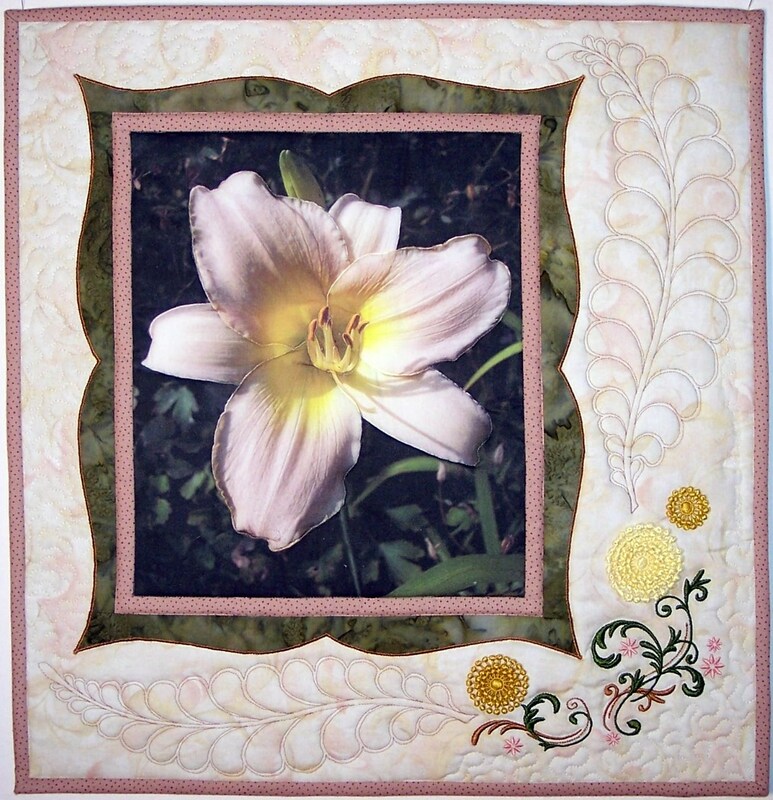 This photo transfer was framed with a pinkish fabric to pick up the pink of the lily, and a green batik to blend with the leaves. 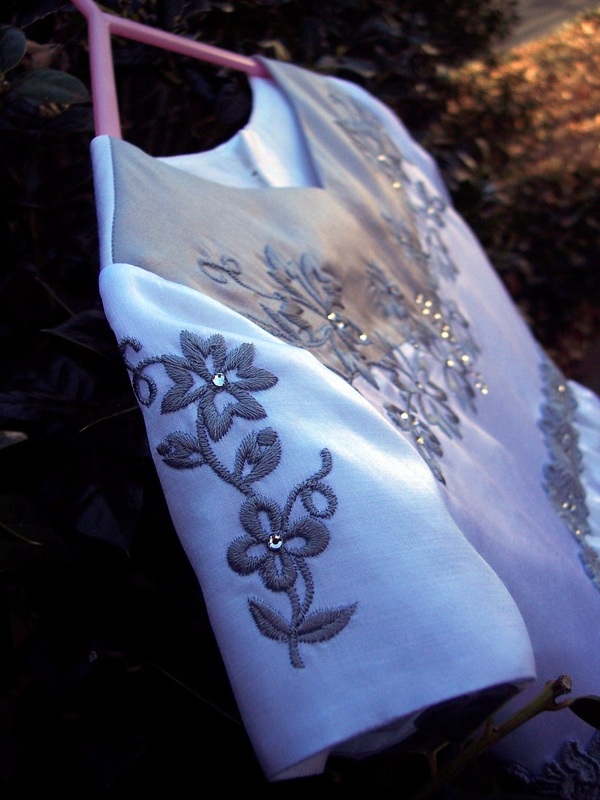 This was appliqued onto a subtle light ivory/cream/pink fabric, which was machine embroidered with OESD swirls that again picked up the colors in the flower. The yellow and gold FSL flowers are from Zundt. This is a photo of a phlox with a big, fat bee! 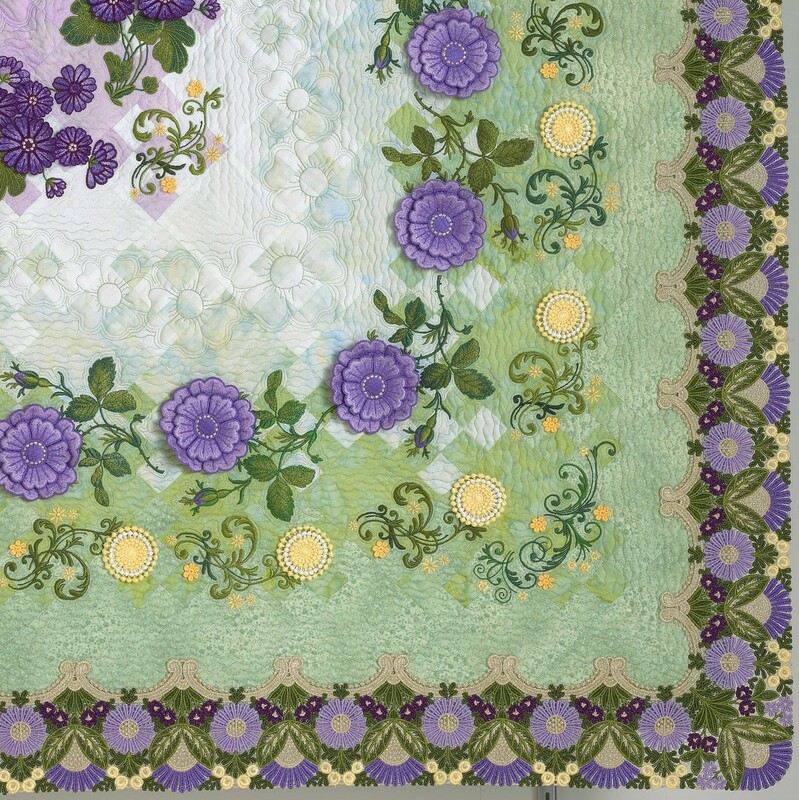 Again, a narrow inner border picks up the colors in the flowers, and tiny FSL Zundt flowers were added after the quilting was done. 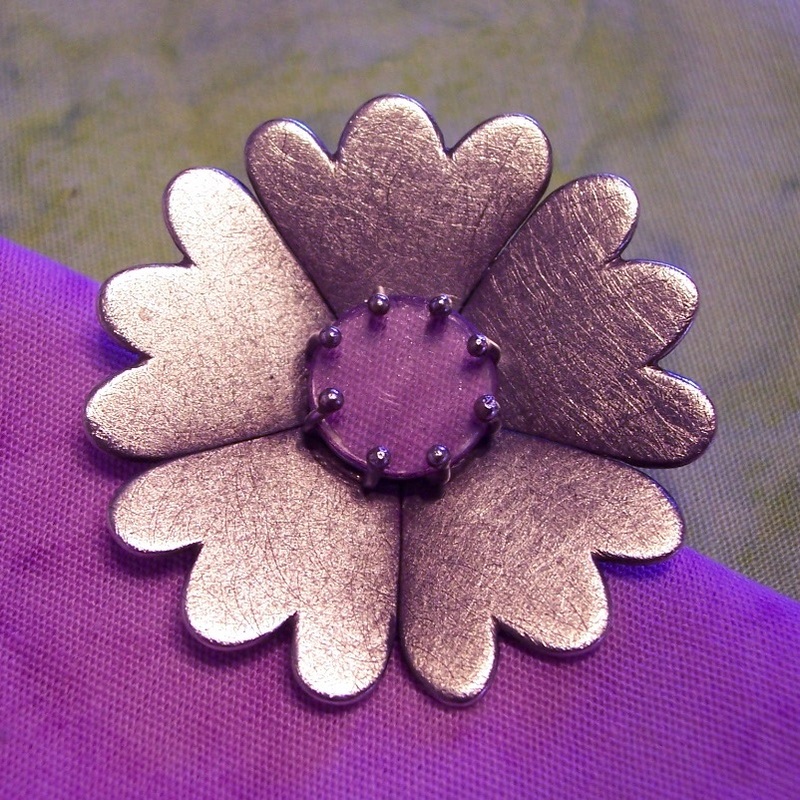 In a previous post, I wrote about the silver-centered FSL daisy pins my daughter made me for Mother’s Day. 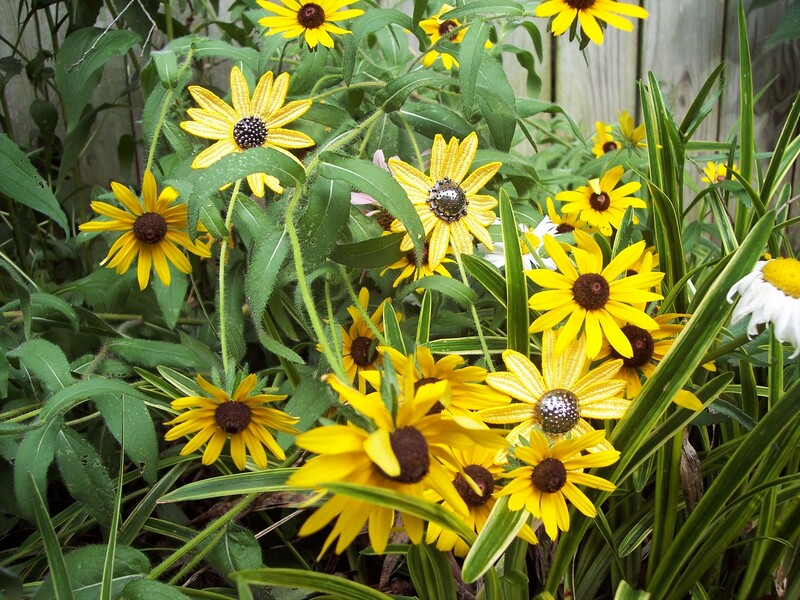 I placed these pins in a patch of black-eyed Susans and took one of my favorite back-yard photos. 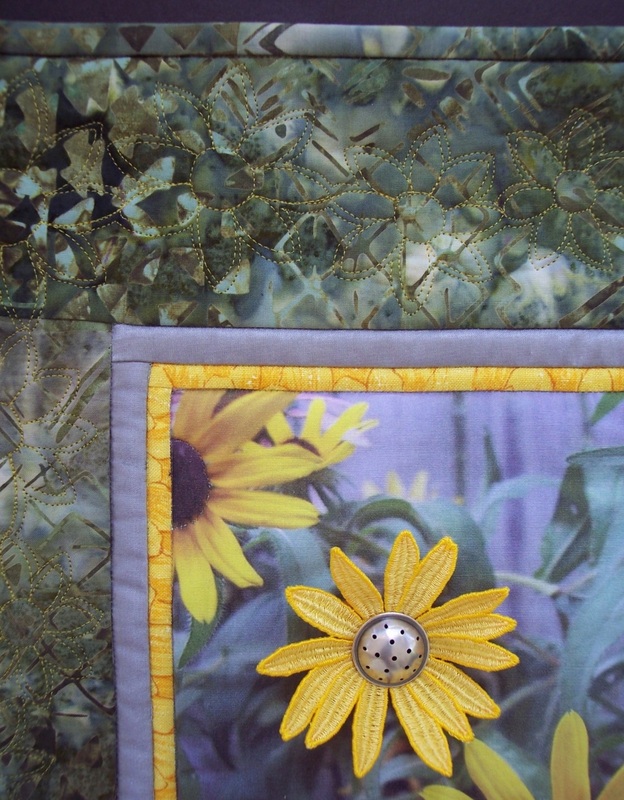 So I took another photo without the pins, transferred the photo to fabric, quilted it, and added a similar pin! 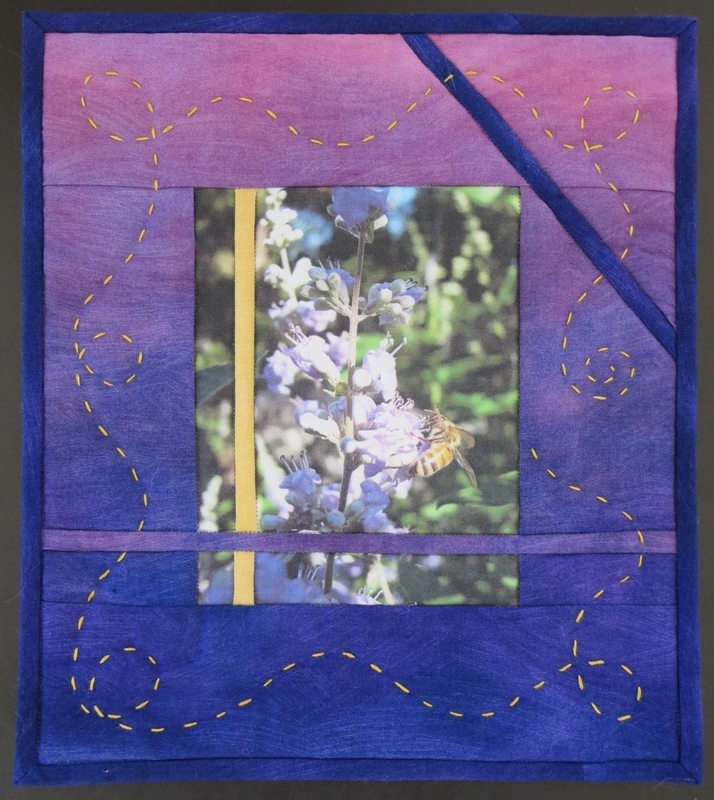 As in the quilts above, I used borders to pick up the colors in the photographs. 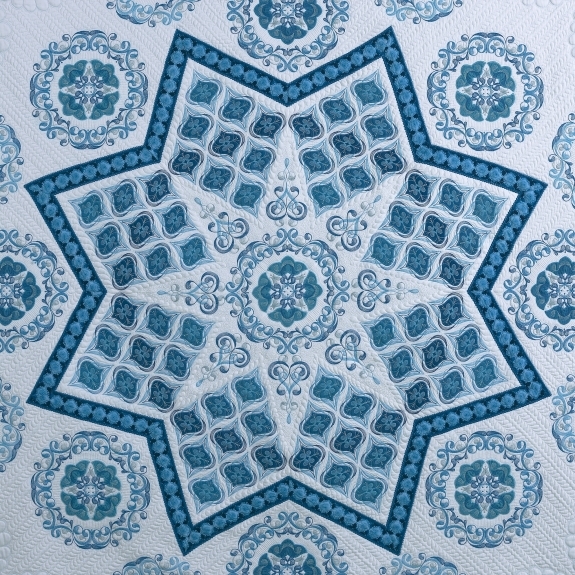 I love this tiny (8.25″ x 9.25″) quilt! Look closely, there’s a honeybee tasting some nectar! 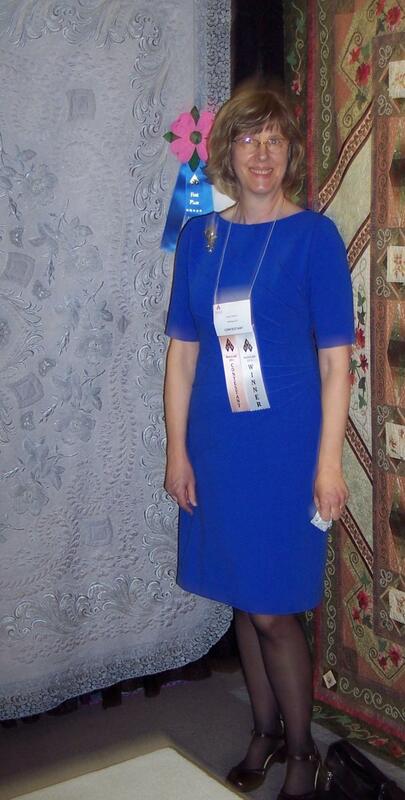 I had some scraps of ombre fabric; I spliced the picture and border with 1/4″ strips of fabric. 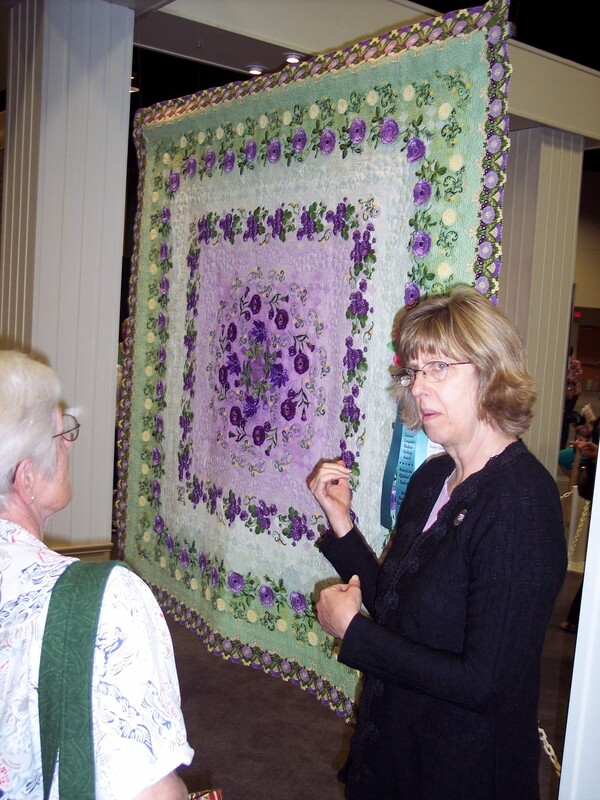 There was a beautiful pinky-peach rose quilt, as well, but I don’t know where it is, and I don’t have a photo of it. I don’t remember what brand of photo transfer fabric I used. My first quilt made with photo transfers was my parents’ 50th anniversary quilt, which I will post about in the future. I had printed those images on my home printer. 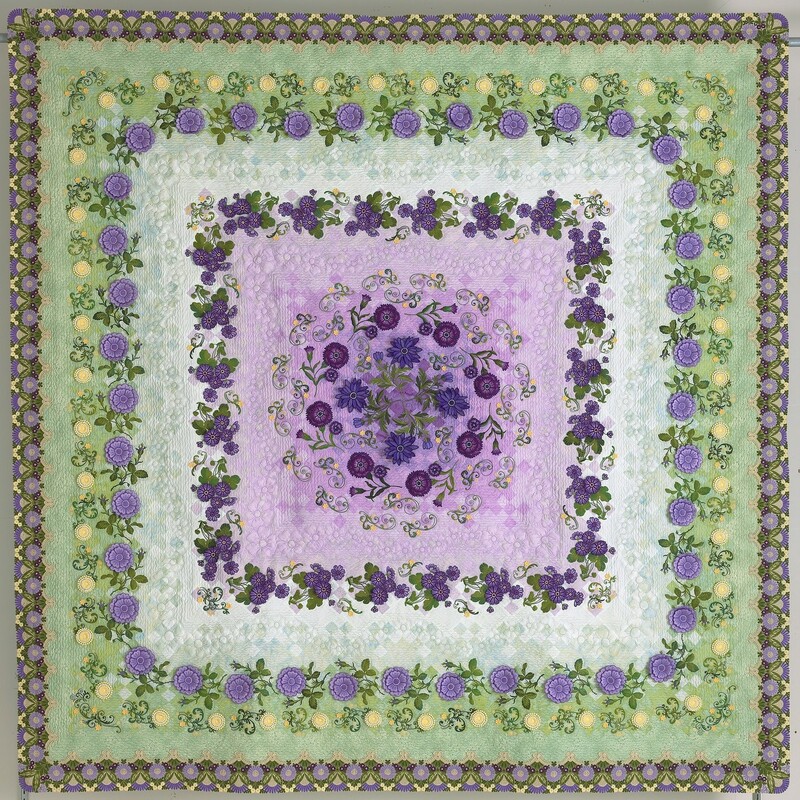 But for these little quilts, I e-mailed the images to my local print shop, then took in the freezer paper-backed transfer fabric, and had them print it. For the cost of a few color copies, I had images that were brighter and more crisp than I was able to print at home. 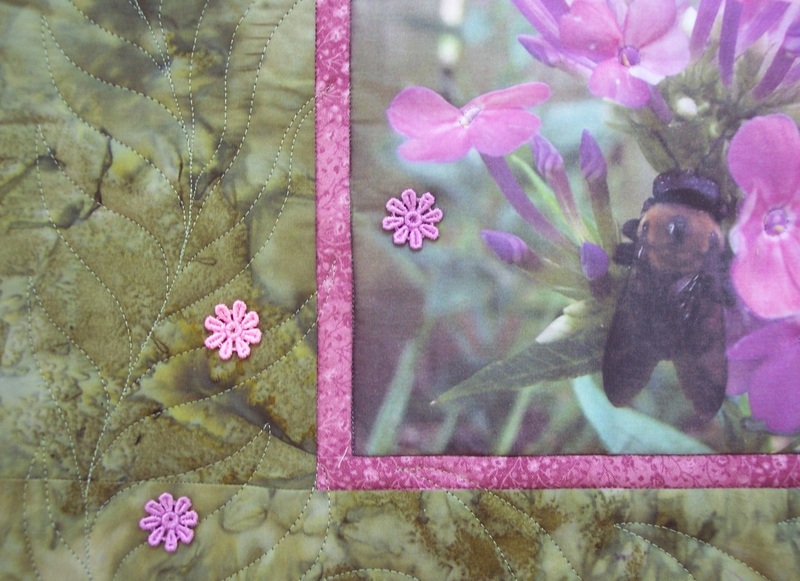 Then I heat-set the ink, trimmed the photos to the size I wanted, added borders, and quilted. Try it! It was fun! 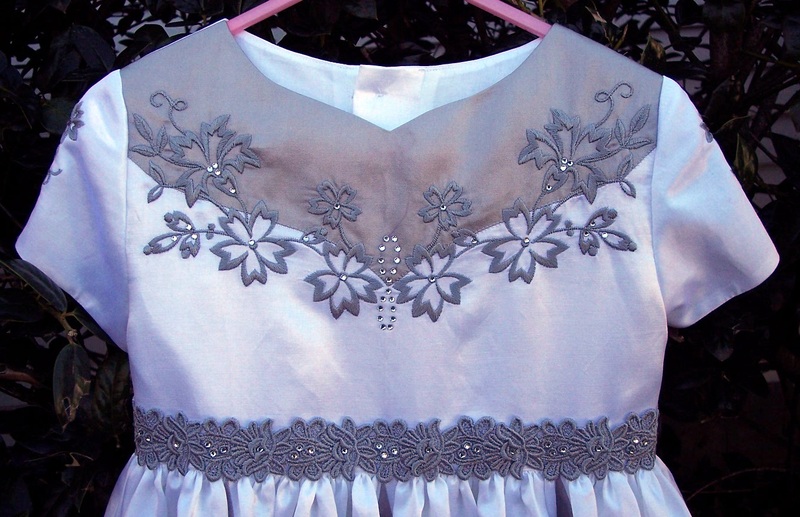 Sterling Silver and Machine Embroidery – Unusual Partners! My daughter is a jewelry artist. About five years ago, trying to find a way to make a little money during grad school, she made these pretty little brooches. 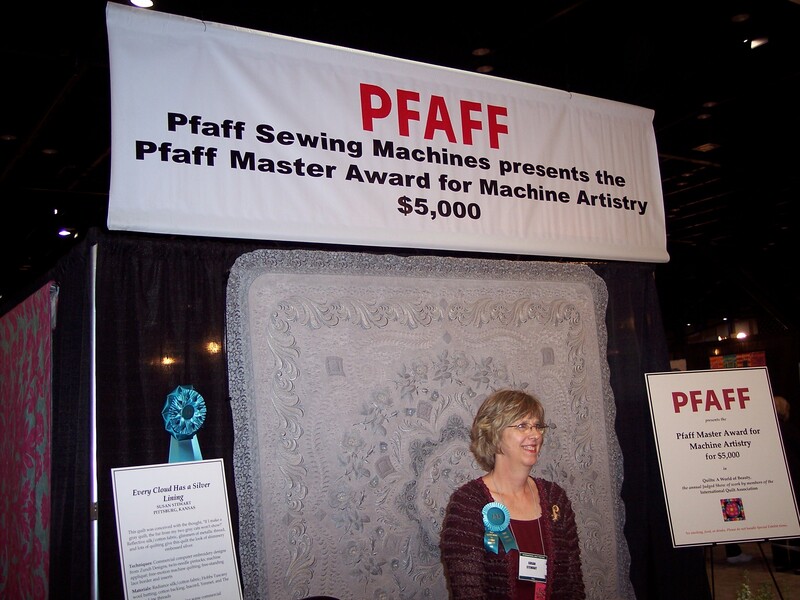 She made the hand-crafted sterling silver centers, and I contributed the free-standing lace machine-embroidered petals. 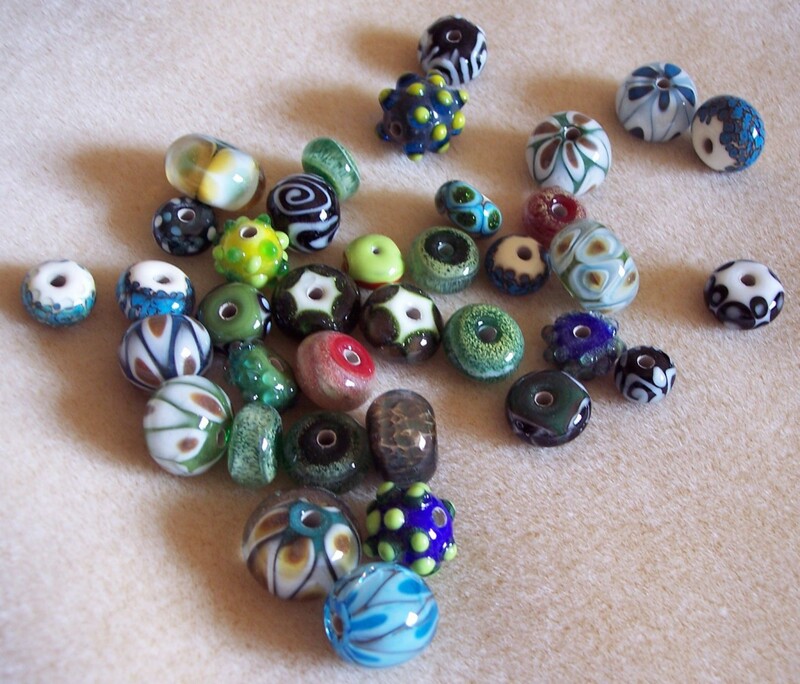 These were really cute, I thought, and very versatile, as the centers could be removed and used with a variety of flowers. 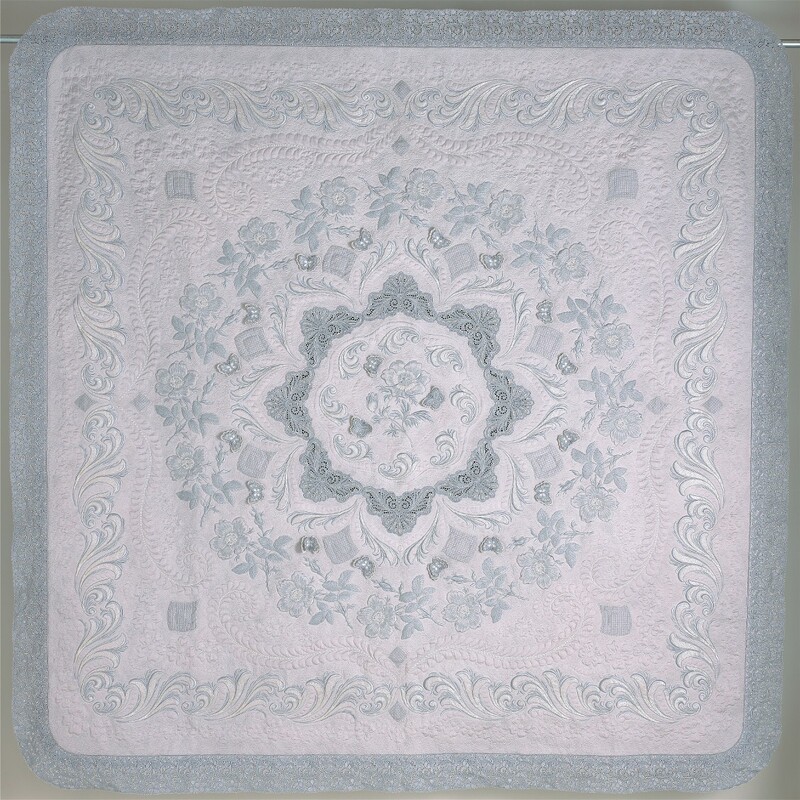 So, of course, I made a quilt with a silver-centered flower! 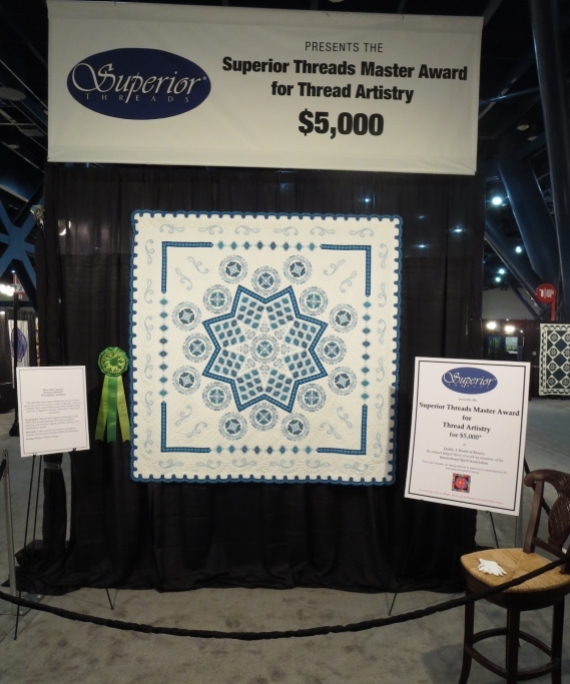 This little quilt was donated to the silent auction at the Houston Quilt Festival in 2010. 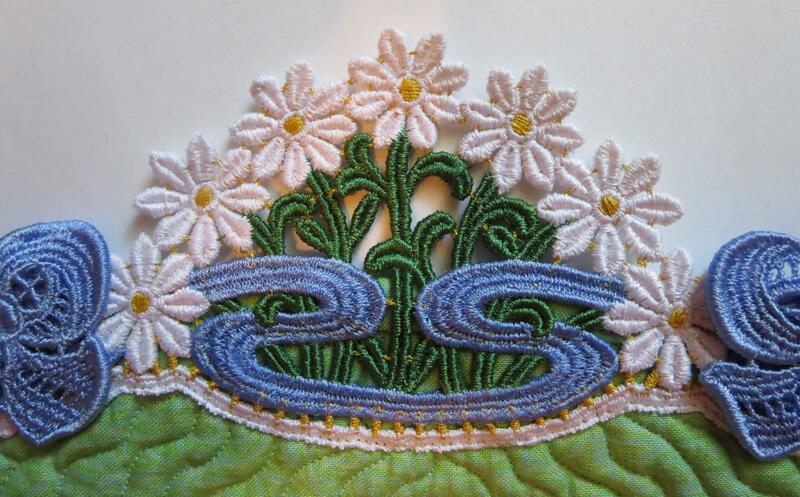 The upper flower is machine embroidery directly on fabric. 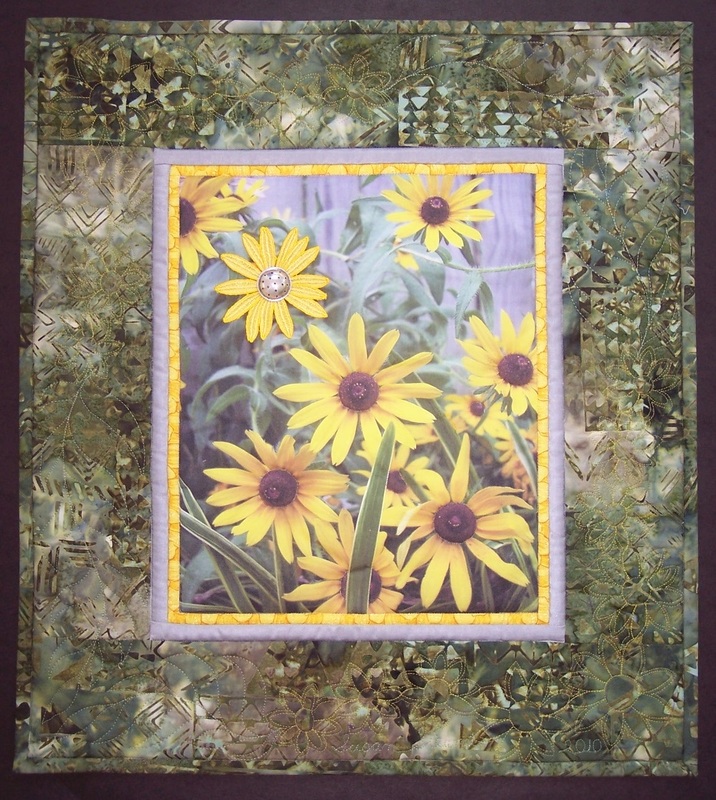 The middle flower is a photo transfer from a photograph I took in our back yard. 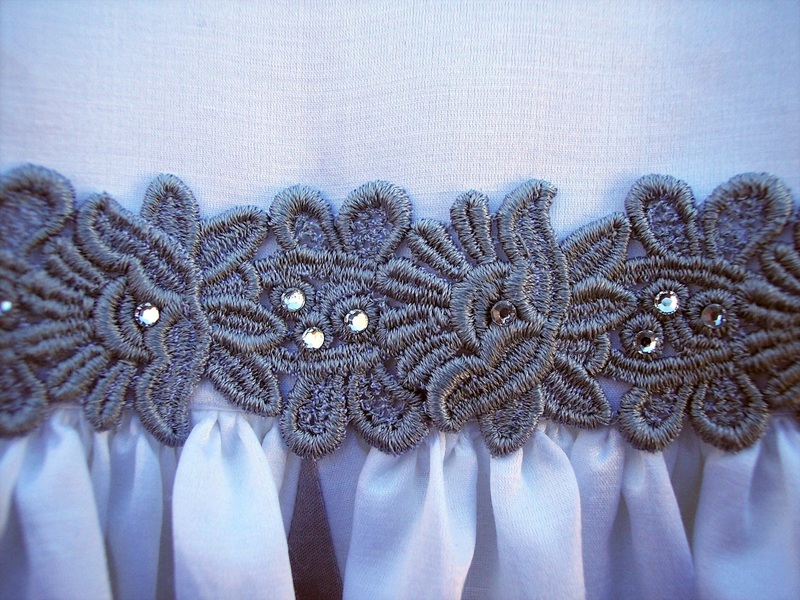 And the lower flower is a double layer of free-standing lace petals with one of the silver flower centers. 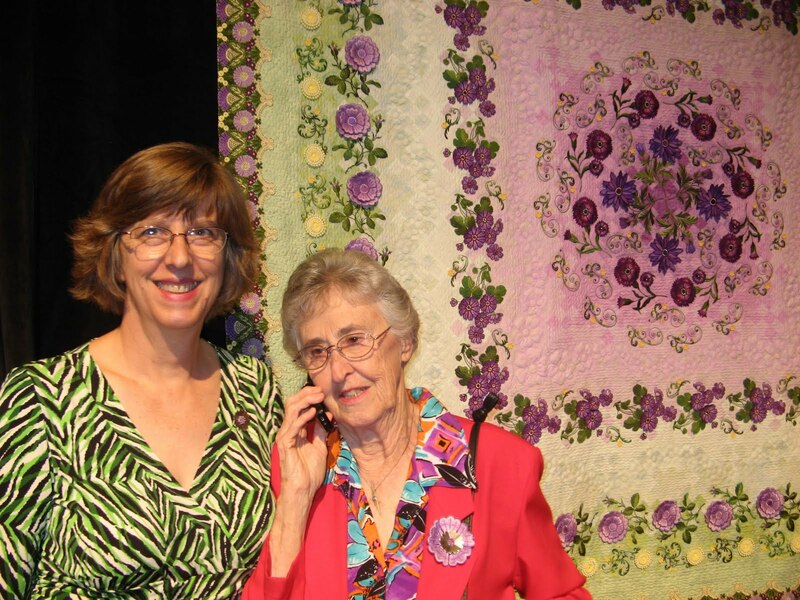 This flower can be removed from the quilt and worn! 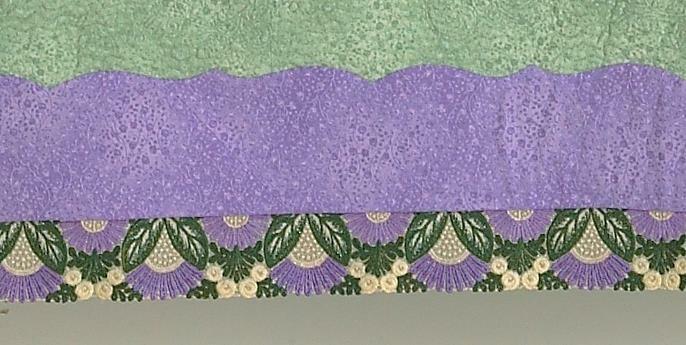 The light green border fabric is silk dupionni, free-motion quilted. 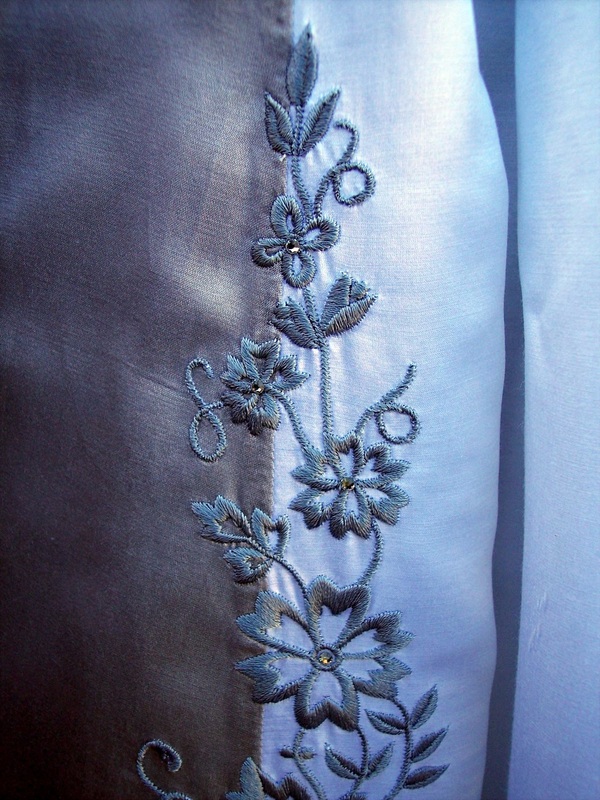 And all the machine embroidery designs in this post are Zundt, of course. Then Annie tricked me! 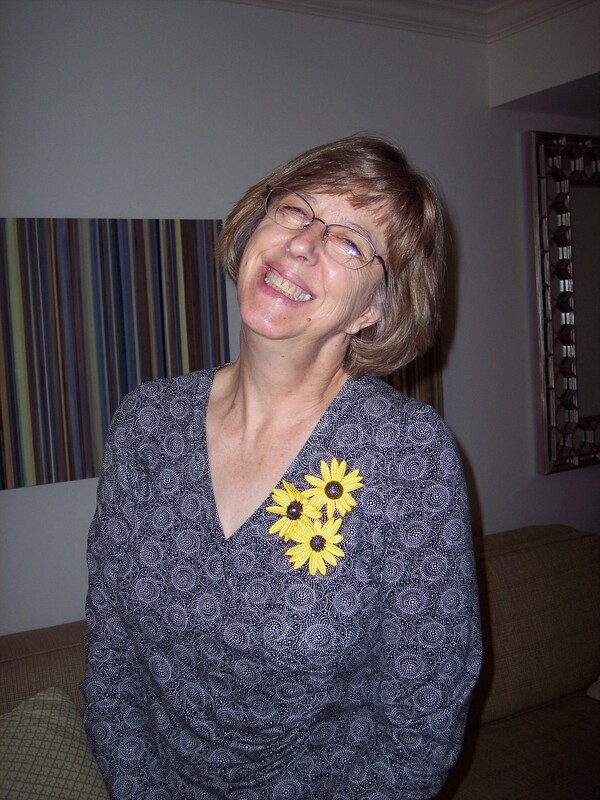 She said she had a commission for three black-eyed Susan pins, and could I please embroider the flowers. Some time later, I received a package in the mail. Three lovely pins for me! So of course I photographed them in their natural setting. Look closely to find the silver-centered blossoms! I’ve worn these a lot. I’m not a “bling-y” kind of person, but these are casual and fun, a mix of silver and thread, and a wonderful reminder of my wonderful daughter!